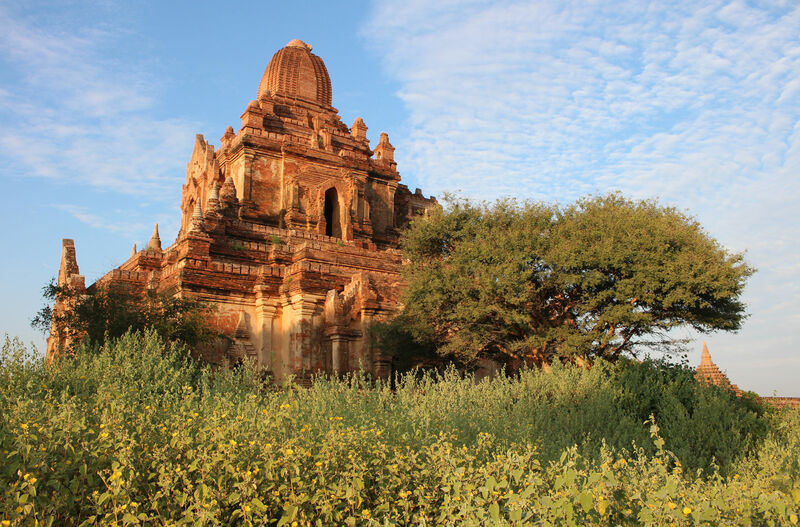 The simple pleasure of a wander across the plains of Bagan, taking one dirt track after another as your eye gets drawn to interesting temples, pagodas and stupas is that it doesn’t stop. There is always another temple or pagoda just that little bit further ahead of you. How can you resist walking a little more, then more again!? It all makes for wonderfully relaxing walks with no-end of delights for the photographer – enough to slow me right down from my usual hurtle through life! 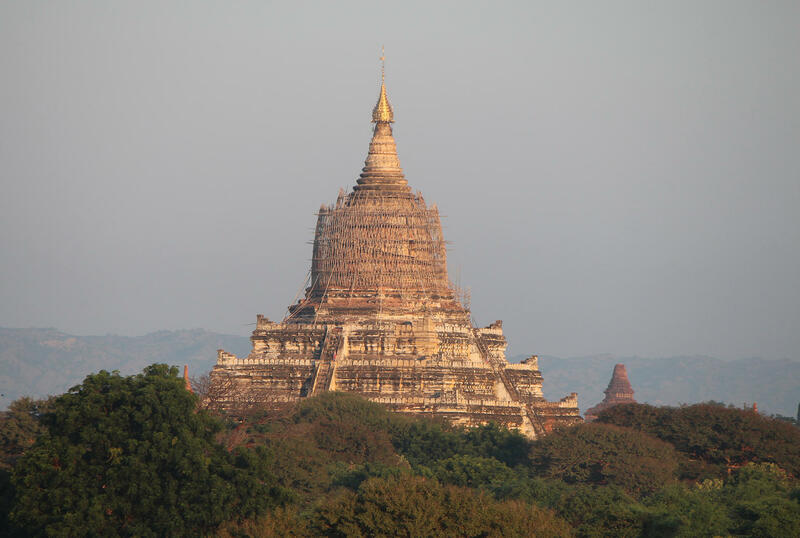 I tried not to be too ambitious with my walks, for example starting with an early morning taxi to Taung Guni for a walk after sunrise one morning, taking in Dhammayangyi Temple on a leisurely wander back to the Bagan Thande hotel in time for a late breakfast. On another occasion I took a taxi to Sulamani Temple and began my wanders from there, enjoying the sight of a flock of goats being herded down the dirt road, before finding a good spot for sunset. 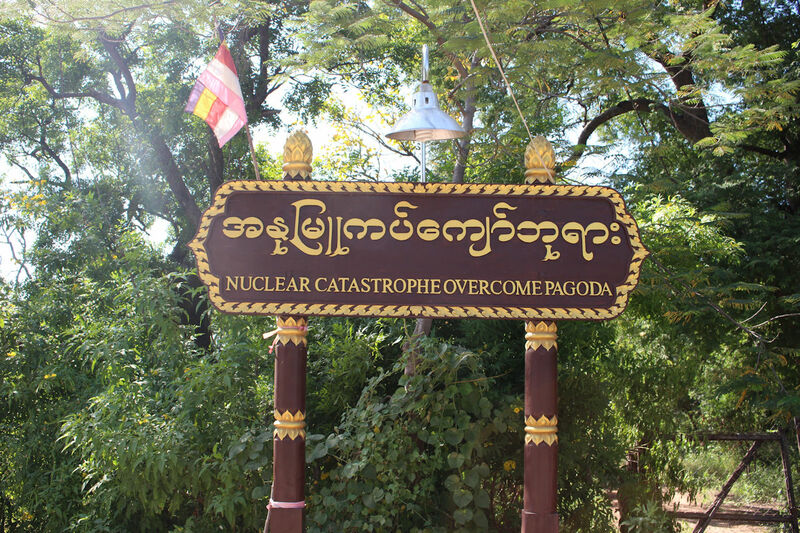 The sights of Bagan took quite a hit when an earthquake of 6.8-magnitude struck on 24th August 2016. 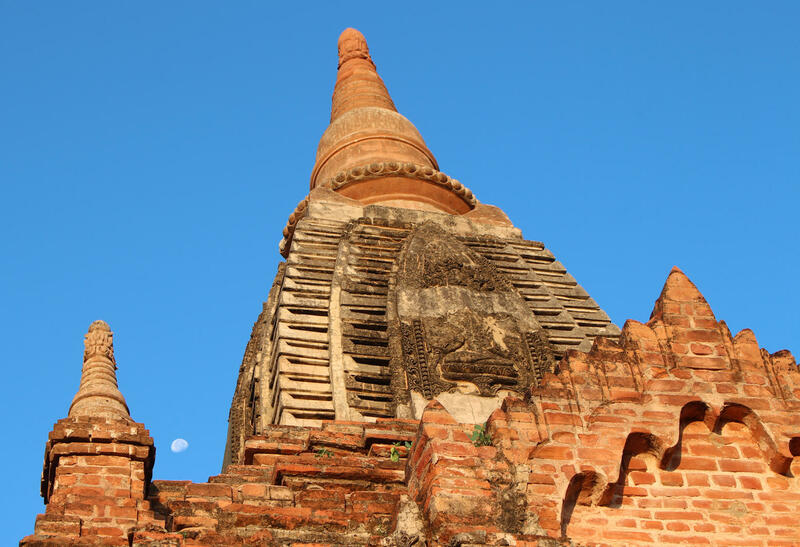 The Ministry of Religious Affairs and Culture reckon that the earthquake affected a total of 449 temples out of 3,252 across the plain. 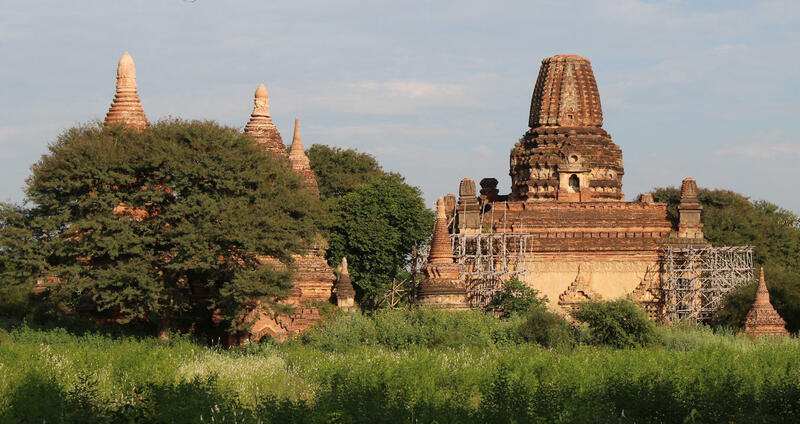 Restoration started with the 36 pagodas at highest risk of collapse, followed by the 53 temples which need urgent repairs. 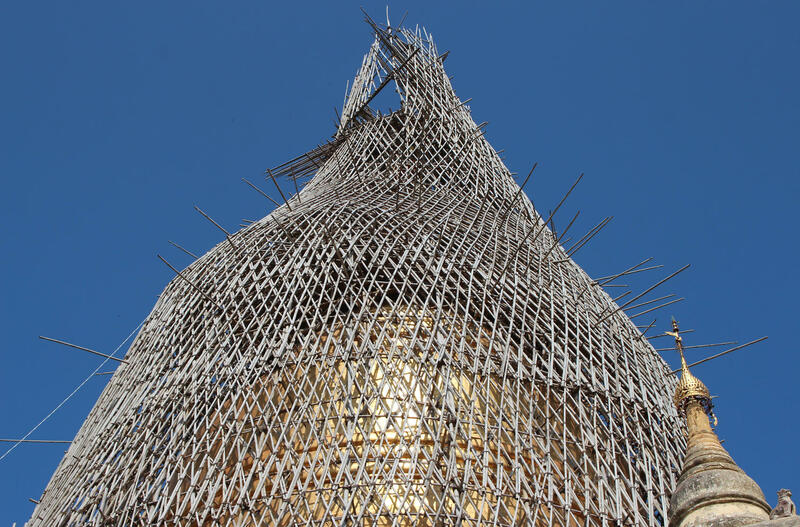 In most places the sight of a major attraction under scaffolding would be a disappointment, but here the use of traditional techniques makes the sight of pagodas under repair a fascinating spectacle in its own right. 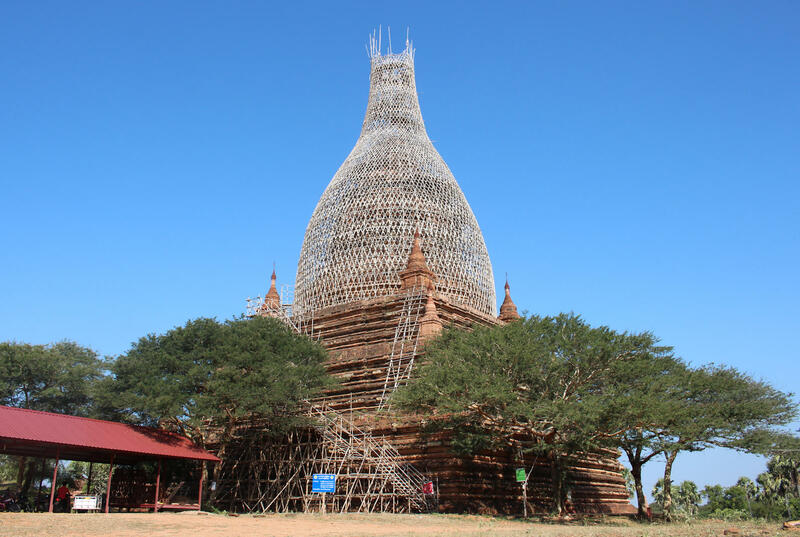 Only a few are covered by unsightly tarpaulins or incongruous modern caps – such as Sulamani Temple and Thatbyinnyu Temple. Now that the rubble has been cleared away it is easy to forget the destructive power of the last quake as you wander. 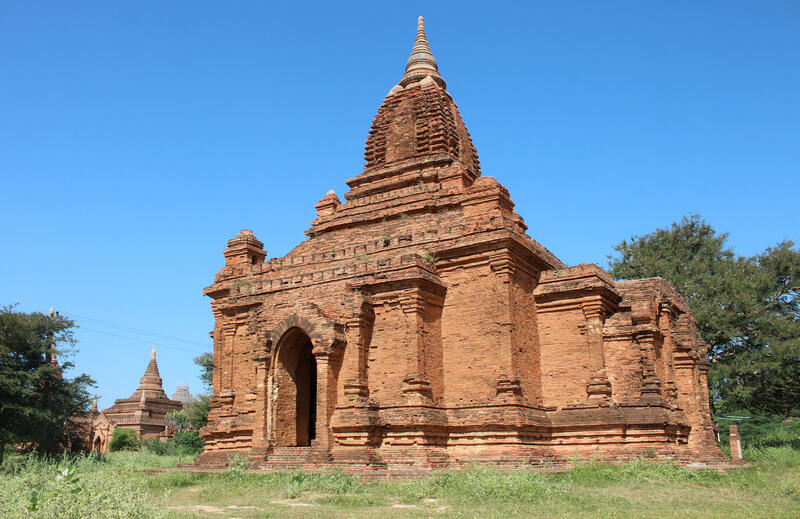 In many cases the damage is not immediately apparent, though the complete closure of temples such as Myauk Guni hints at the lingering danger from unstable brickwork and the like. 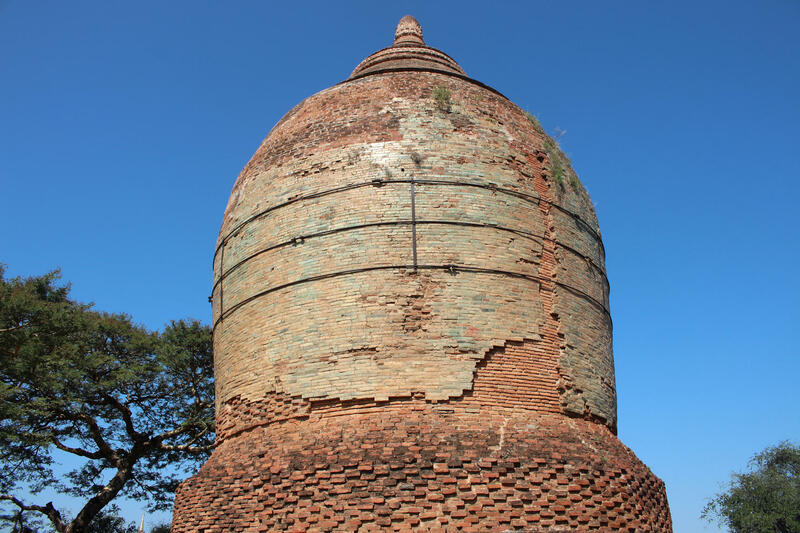 The earthquake may yet have done some good with the opportunity to restore these pagodas and temples more accurately than in the past, led by experts from UNESCO. 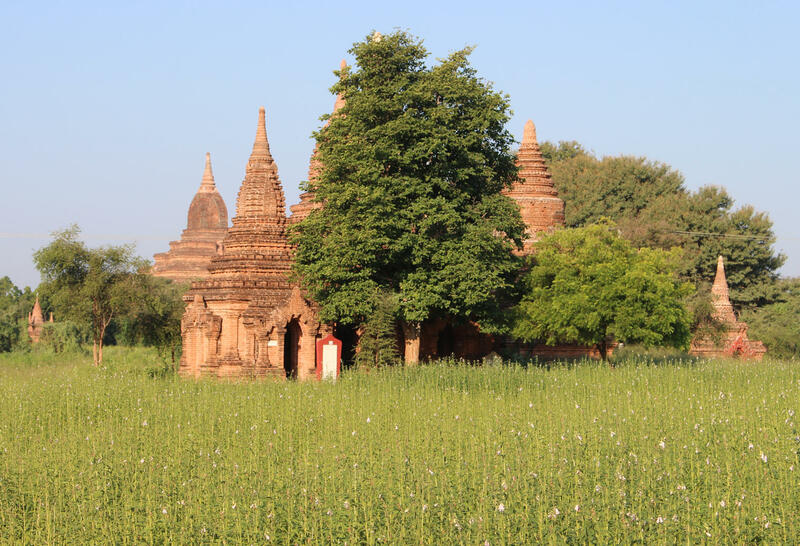 Our four nights in Bagan seemed a sensible length of stay and we just about managed to avoid becoming templed out, though I will admit that my enthusiasm for stepping in and out of temples was slipping on my last afternoon of wandering. 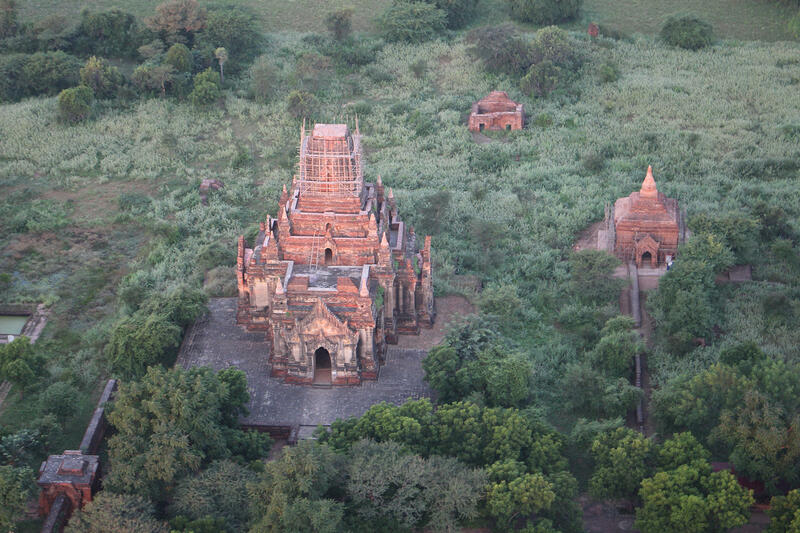 I don’t know how the balloon pilots cope with months here with very little other than temples to see! 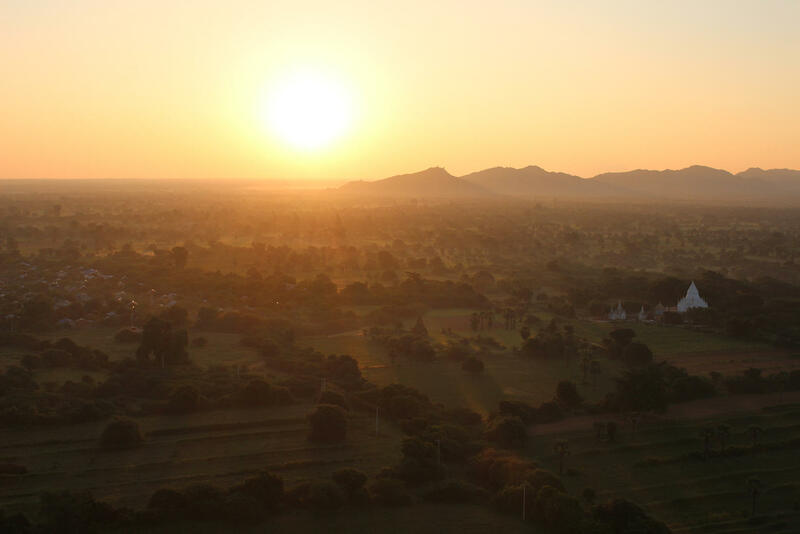 Almost by chance I stumbled across the perfect spot to end the trip – a raised viewing platform ten minutes walk away from Sulamani Temple which offered a lovely view of the setting sun on a horizon filled with temples. I think it may be the site referred to in newspaper reports as Oh Htein Kone though the lack of signage makes it a little hard to be certain (the entrance includes a noticeboard describing the ‘pottery hill’ of Otein Taung). 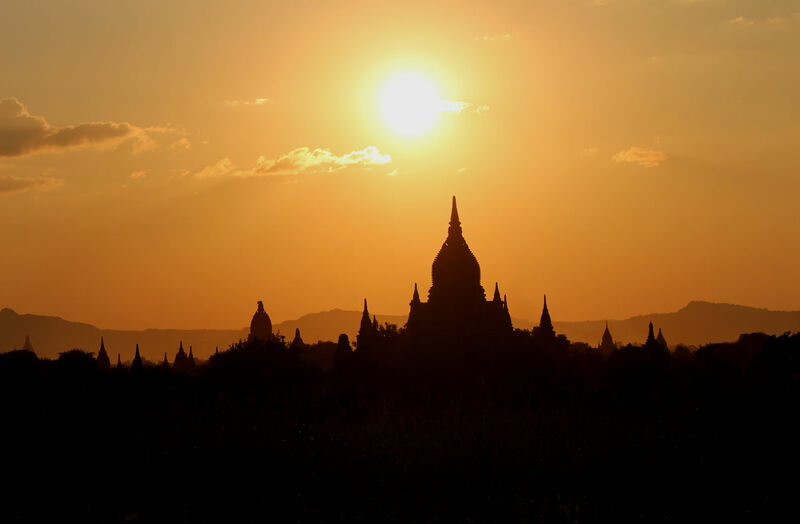 After enjoying a gloriously red sunset I made my way off the plain in the fading light, returning to my hotel for a last meal under the acacia trees before packing in readiness for our return to Mandalay on an early morning flight. The idea of flying in a balloon terrified and thrilled me in equal measure but ultimately the opportunity to see such an incredible archaeological spectacle from the air overcame my doubts. I booked a place, months and months ahead of the trip, hoping that I wouldn’t regret my decision! 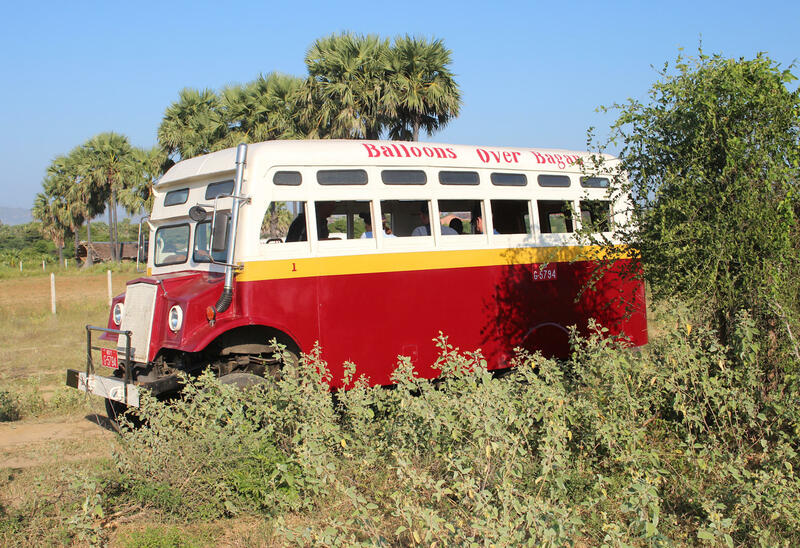 On the morning of the flight I headed down to my hotel reception ready for a 5.20am pick up and was soon on my way to the launch site in one of the beautiful vintage teak buses that Balloons over Bagan have restored. After reaching the launch site, near to the Bagan Golf Club, we were able to relax a little with some coffee as we watched the small weather balloons being sent up to assess the wind direction. 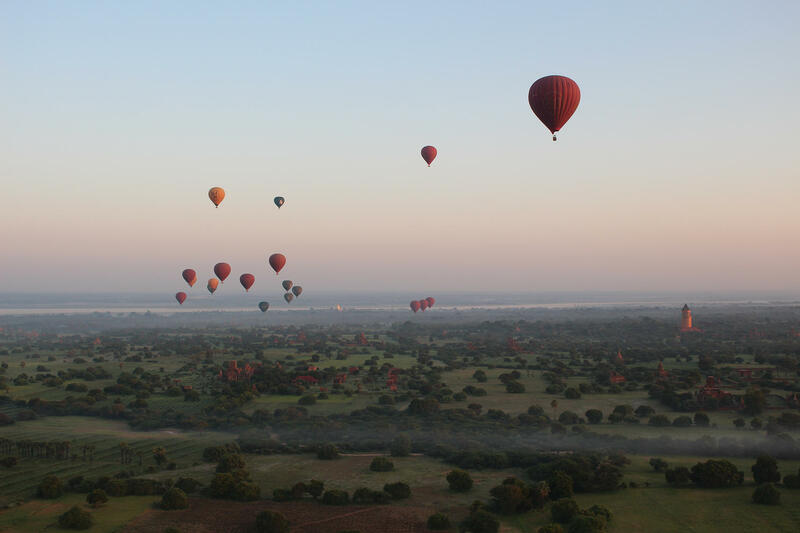 Flights start in early October each year and the number of balloons gradually builds up over the month. Last year they managed to get balloons up on 24 days in October but the weather this year has been terrible and they have only been able to fly on 5 days. Flights are usually booked up long before the start of the season so it’s pretty tough if flights are cancelled as there’s little chance of re-booking for another day. Thankfully, the wind was blowing perfectly for the optimal flight path and the skies were clear. 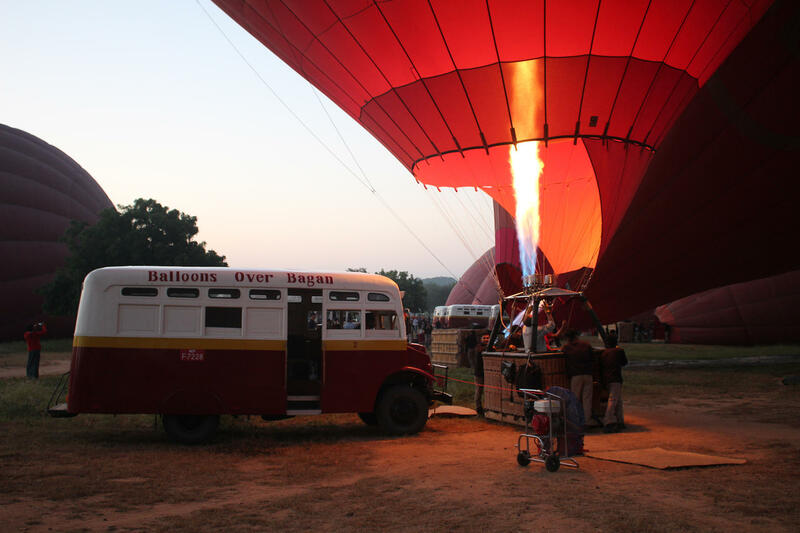 One of the things that impressed me most about Balloons over Bagan was their utter professionalism and strong focus on safety, overcoming my initial doubts about ever stepping into a balloon basket! 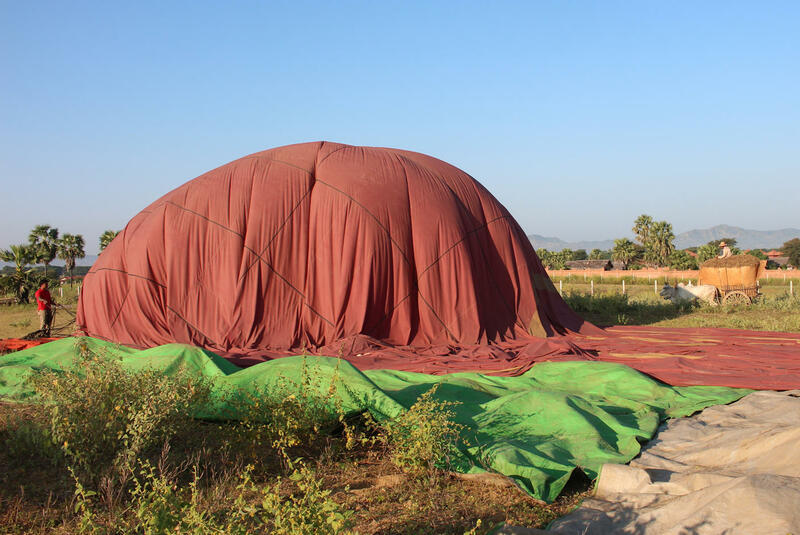 Before the inflating of the balloons began we were taken through our safety briefing by our pilot, a balloonist with decades of experience and in his sixth season at Bagan. The thorough briefing gave us all the essentials, including the landing position that we would need to adopt. It had never occurred to me just how skilled a balloon pilot has to be in a setting like this. To start with pilots have to be qualified with a British commercial balloon licence and on top of being capable of piloting their balloons they have to be able to fly in a large group, cope with the company’s rigorous procedures, handle communications with other balloons/air traffic control and look after their passengers (everything from pointing out the sights to taking pictures of the group with a go-pro strapped to the balloon). Our pilot made all this multi-tasking look effortless but its not surprising to hear that some very good balloonists haven’t been able to handle all of that. The very experienced local crews set about inflating the balloons and beckoned us over when it was our time to clamber aboard using the footholds in the basket. There was no graceful way to do this but I got myself in somehow. In no time at all our balloon started rising – ever so gently – giving us a great viewpoint over the field of balloons, all at different stages of readiness. I was really surprised that my fear of heights never kicked in at any point during our one hour long flight. I loved every second of it. I don’t know how much the route has altered in recent years due to government restrictions. 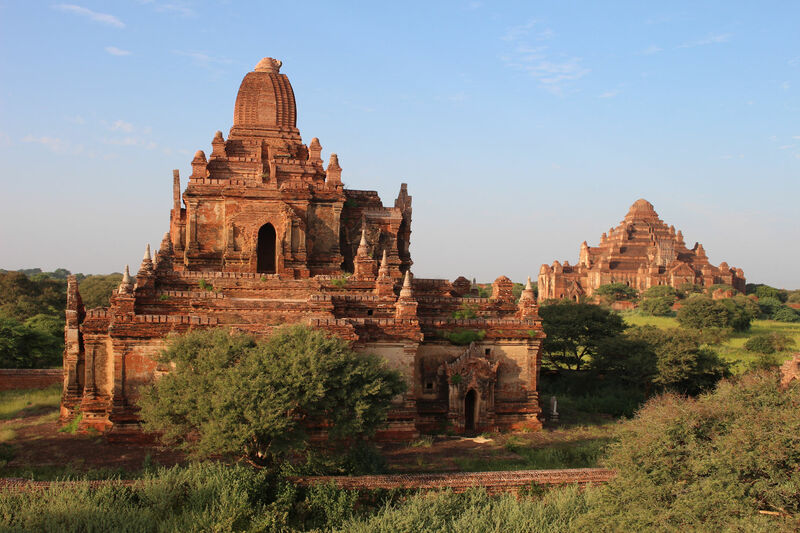 Although we didn’t fly over the centre of the monument zone we certainly had a terrific view over the pagodas on the Bagan plains and flew directly over some smaller temples at a height of around 400m. All the while our pilot explained the basics of balloon flight and kept up an impressive commentary, pointing out sights that we might easily have missed from blue winged rollers to brickworks. The balloon turned all the time, giving us all opportunities to photograph the sights we were passing. 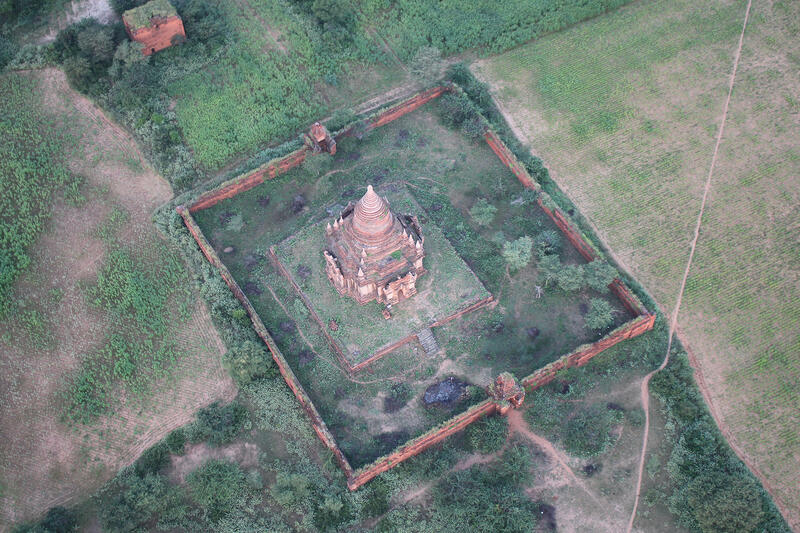 Our flight took us from the launch site near the Bagan Nyaung U Golf Club on a route over Thinganyone Temple, Sinbyushin Monastic Complex, Pyathetgyi, West Pwazaw village, Thitsarwadi and Thuntekan village before landing in a field just beyond the new hotel zone. 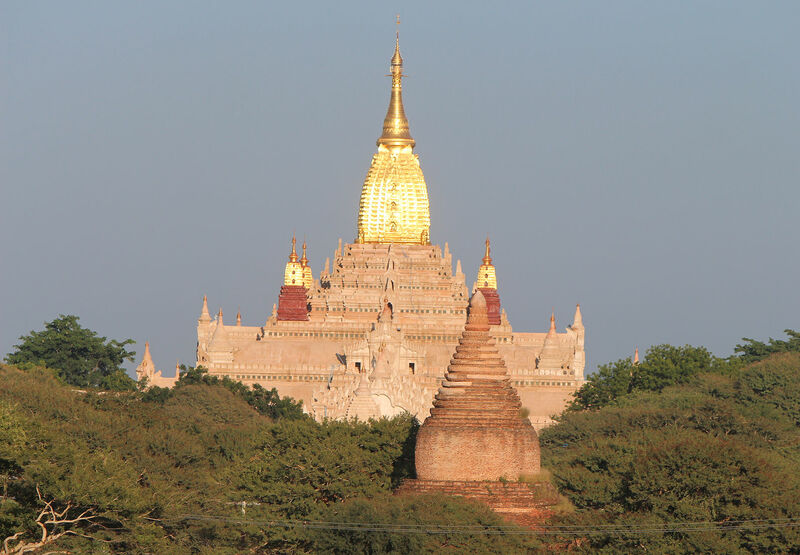 The preferred option of a landing spot on the sand banks will become available in a few weeks when the waters of the Irrawaddy River drop. As we came in to land we were asked to put our cameras away and adopt the landing position (seated, head back against the basket and holding the two hand grips tight). One hard bump and a smaller follow-up got us safely onto the ground. Our pilot kept the balloon inflated to help the ground crews find us at our improvised landing spot. Once we were able to clamber out the crews set up some tables for a terrific breakfast that included fried eggs with cubes of bacon served up in a small pan, a selection of cold meats and cheese, fresh croissants, bread with a passion fruit marmalade, some really terrific tamarind juice and champagne. Quite a way to celebrate a quite amazing morning in the air! The food was all produced by Sharky’s restaurant. One of the side-benefits of overshooting our target field was that we were not swamped by sellers. One talented local artist, Ruby, found us and presented his beautiful sand paintings of the balloons and temples. The last thing I was planning when I set out in the morning was to buy a painting but in the euphoria of our return to earth I bought one as a memento of a special day. All that was left now was for us to board the bus ready for the drive back to our hotels. 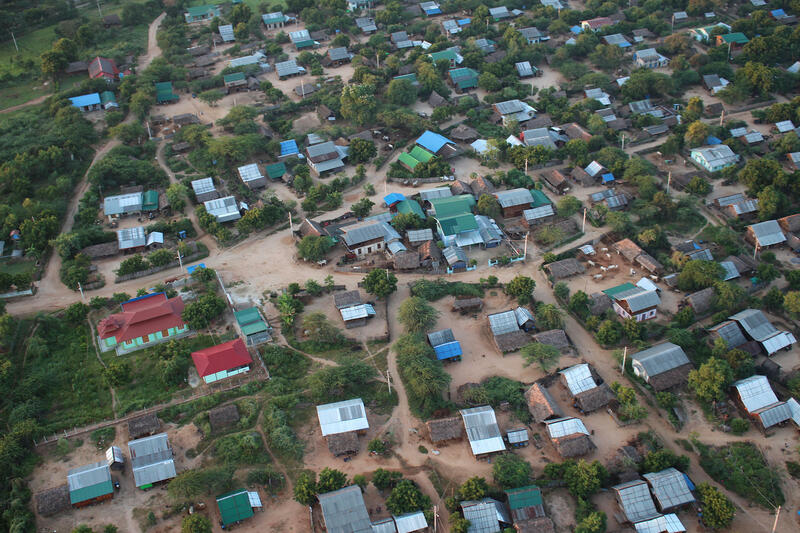 Along the way we heard a little bit more about the investment that Balloons over Bagan makes in the local community, such as the provision of electricity for Tha Htay Gun village. I reached my hotel at 8.30 and found it hard to believe that there was still a full day ahead of us ready for sightseeing! 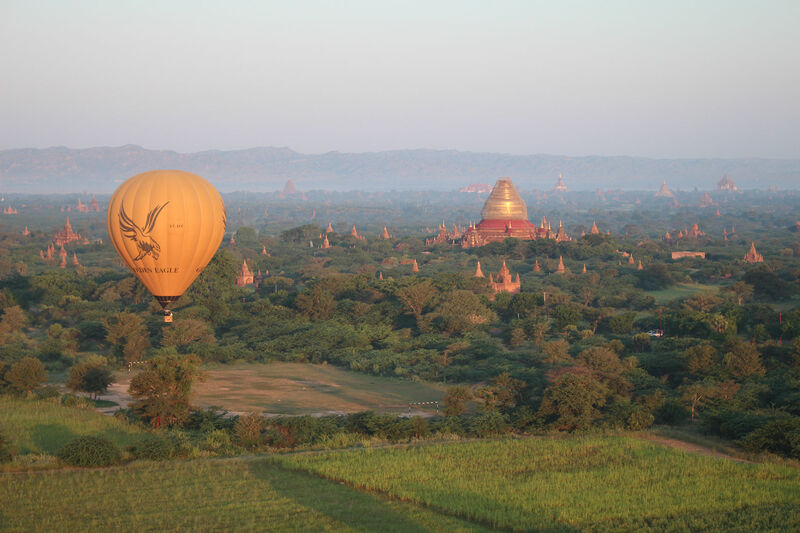 Around 20 or so balloons take off each morning, weather permitting, operated by three balloon companies: Balloons over Bagan, Golden Eagle Ballooning and Oriental Ballooning. 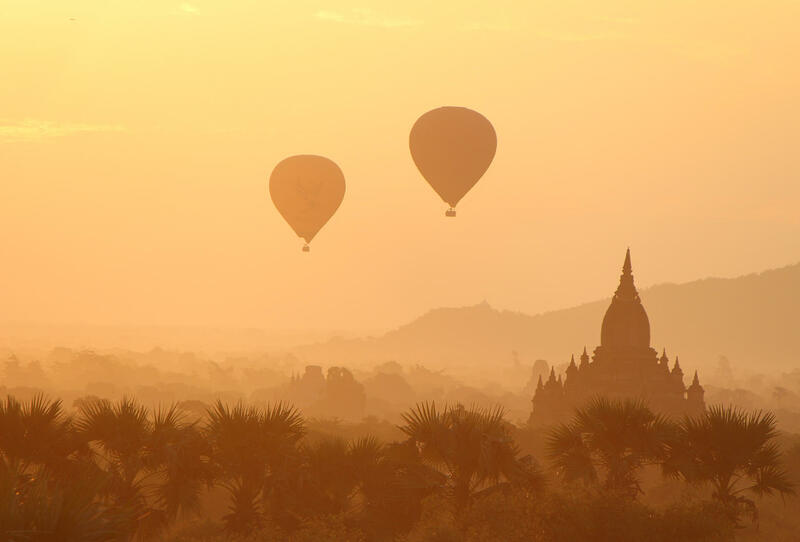 I kept an eye on the Balloons over Bagan website and booked my flight when I saw availability for the dates of our stay starting to drop, approximately 8 months ahead of our trip. A couple I spoke to on the morning of our flight said that they had struggled to get seats 6 months ahead and had to go on a stand-by list. 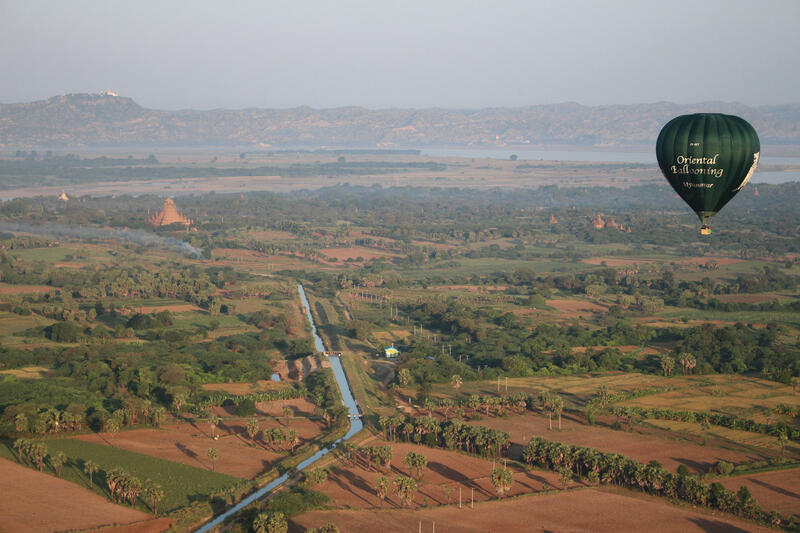 My flight was booked in one of the smaller 8 person balloons flown by Balloons over Bagan, the company that first brought balloons here and the largest of the operations today. 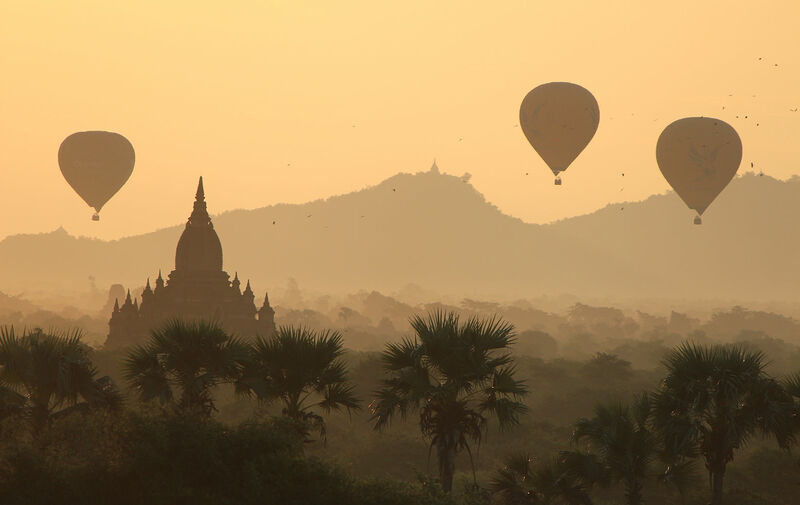 A smaller balloon is reckoned to be a better option for photographers, but if that hadn’t been a consideration I could have gone for one of the standard 16-person balloons offered by Balloons over Bagan at $340 per person. Not cheap at $450 but if you are going to do something like this, once in a lifetime, I figured you might as well do it properly. I didn’t regret my choice! 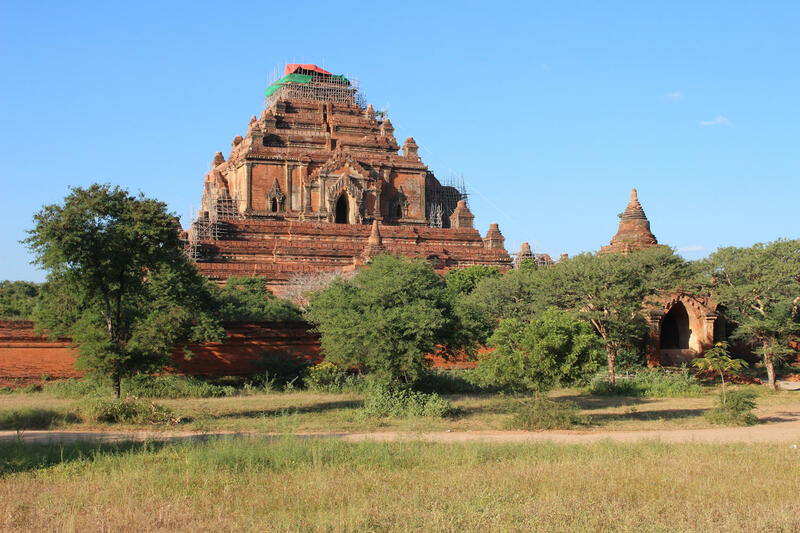 It is quite impossible to see all of the 2000+ temples in Bagan on a single visit, which means making some hard decisions about what you are going to make a beeline for. 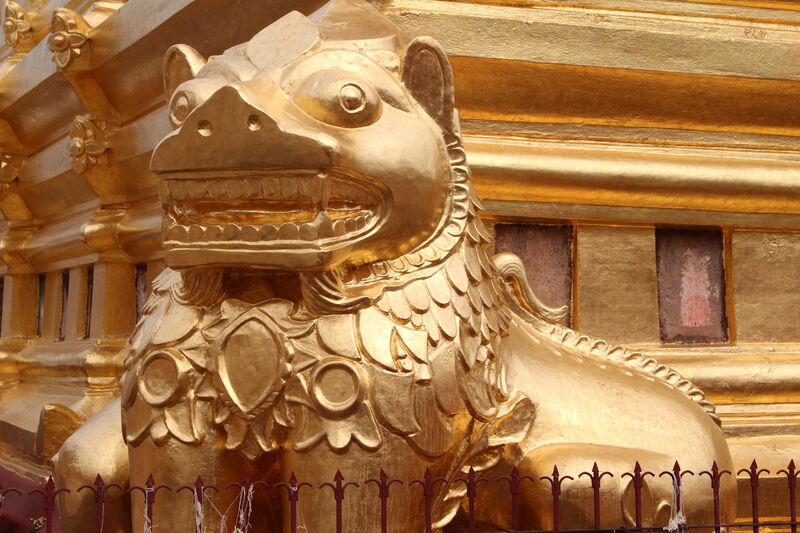 Even if you come up with a reasonable plan it is likely that you will still end up leaving out temples that would be major tourist attractions in their own right if they were located anywhere else. 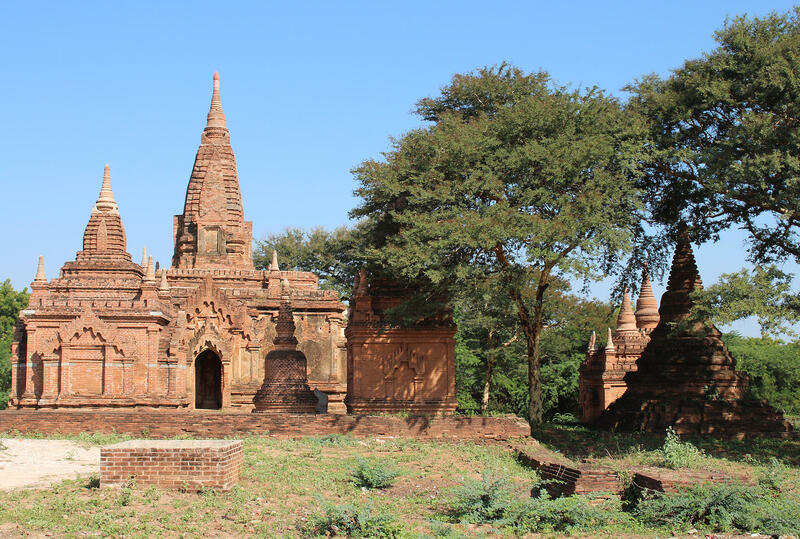 I didn’t have a well defined plan, but it roughly worked out as half a day on the temples in/around Nyaung U, a day for the temples of Old Bagan, a day wandering the plain and a half day for the temples in/around Myinkaba Village. 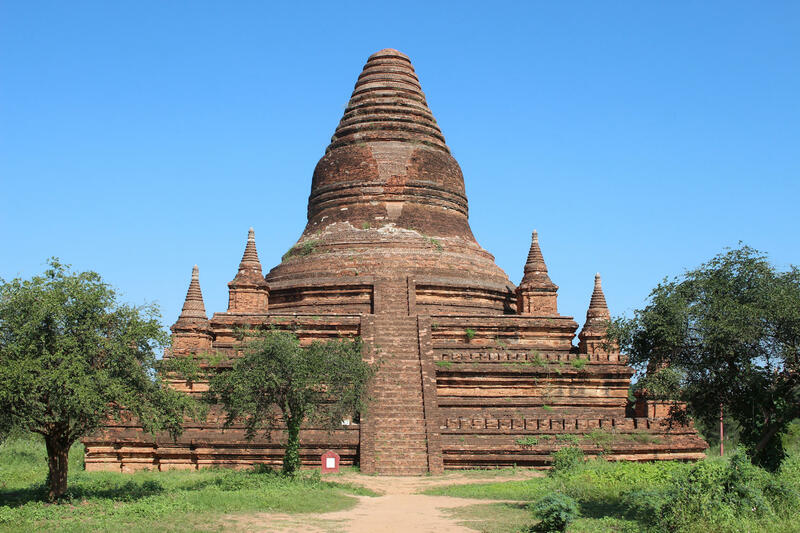 I would have liked to get out to Dhammayazika but that was a little too remote and didn’t easily fit with the general drift. 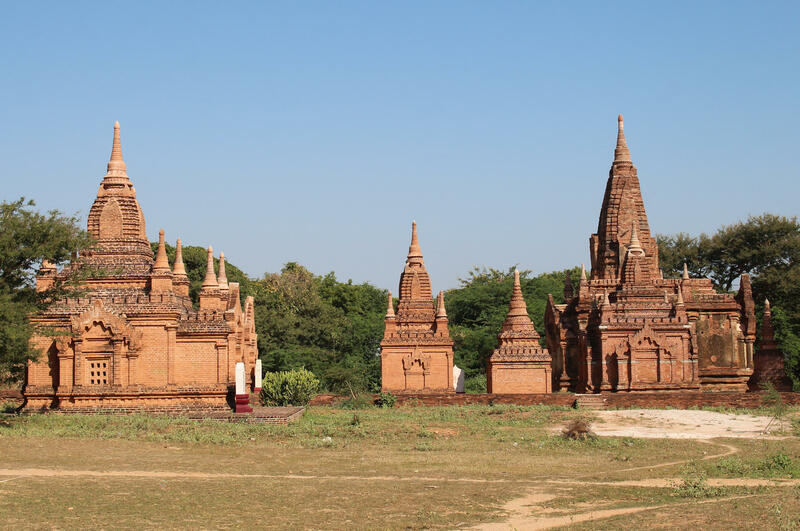 Any list of temples in Bagan is going to be pretty subjective, but these are seven highlights and some of the quirkier sights that we saw along the way. 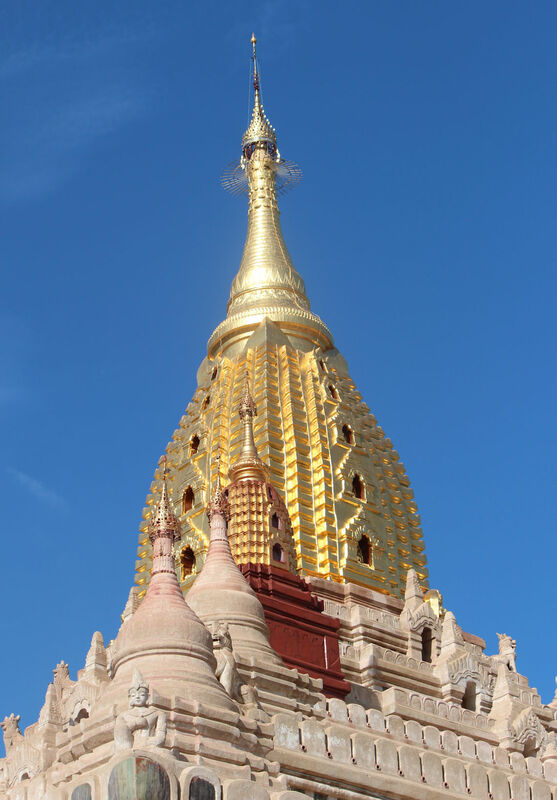 The sheer beauty of the Ananda Temple has drawn many comparisons with Westminster Abbey, which was constructed in the same year (1090). 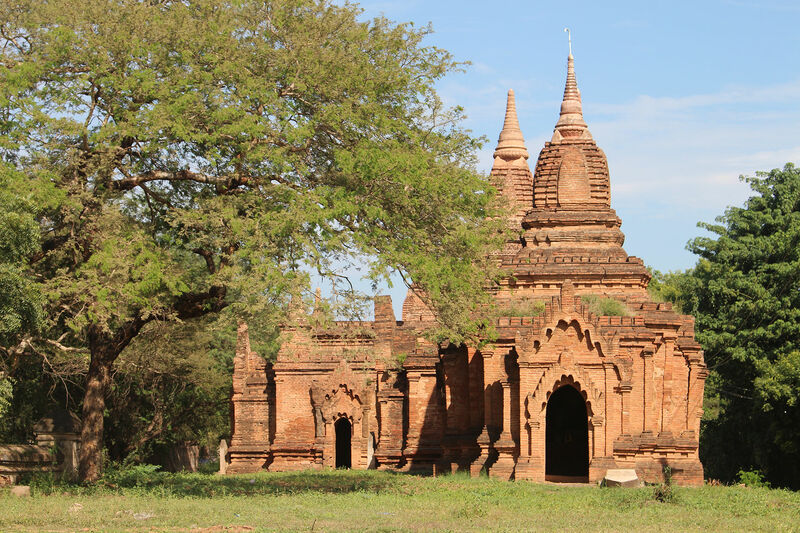 The temple was built by King Kyanzittha, ruler of the Pagan Empire from 1084 to 1112, in remembrance of Ananda, a disciple of Buddha. It’s a stunning sight, inside and out, which deserves plenty of time and attention to fully appreciate its exquisite detail. 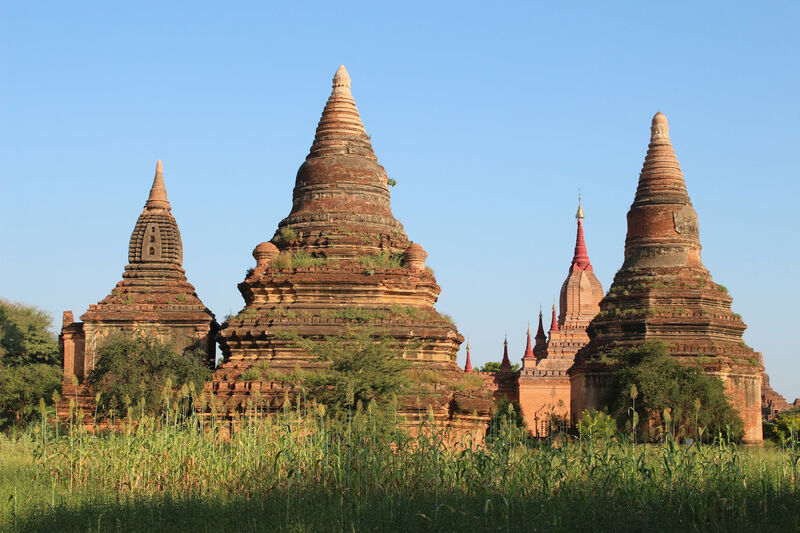 The temple is the second largest in Bagan with a shimmering spire that rises 52 metres that draws the eye whenever you catch a glimpse of it (complete with niches containing statues of Buddha). 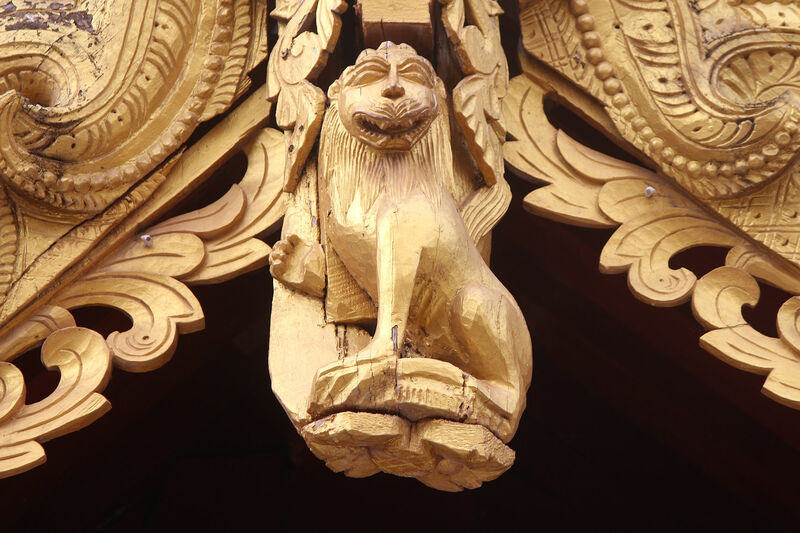 However, the gilding is a relatively recent alteration – added in 1990 to commemorate its 900th anniversary. 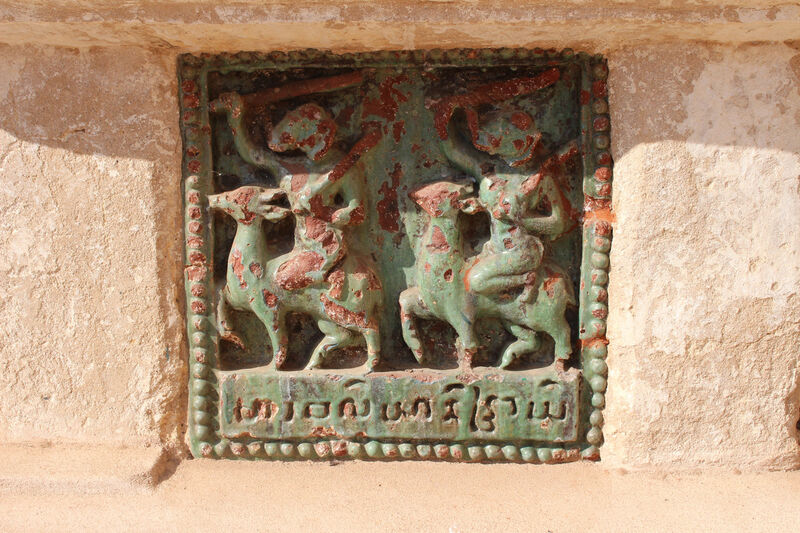 At ground level there are plenty more detailed artworks to admire, including a remarkable sequence of green-glazed terracotta tiles telling Jataka stories and stone chinthes guarding each corner. Stepping inside opens up a new degree of wonderment. 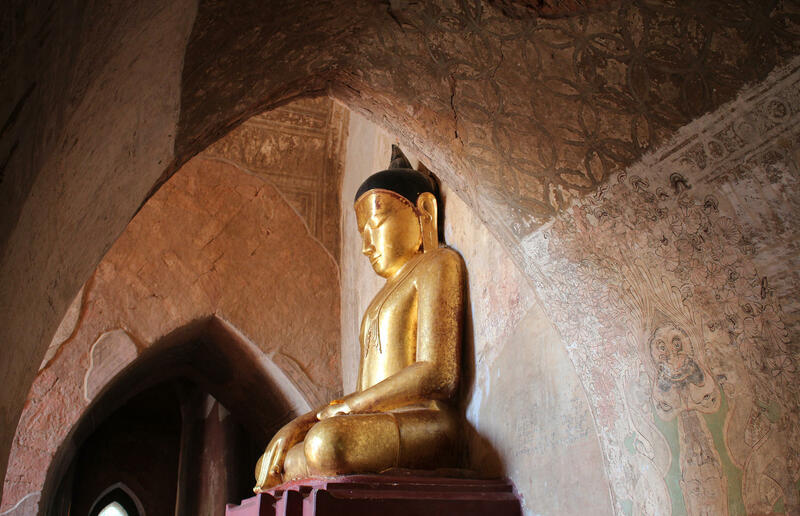 Upon entering the temple you find yourself walking towards one of four giant Buddhas that tower over everyone, two originals and two replacements added after a fire in the 17th century. The floor plan resembles a Greek cross with four entrances. 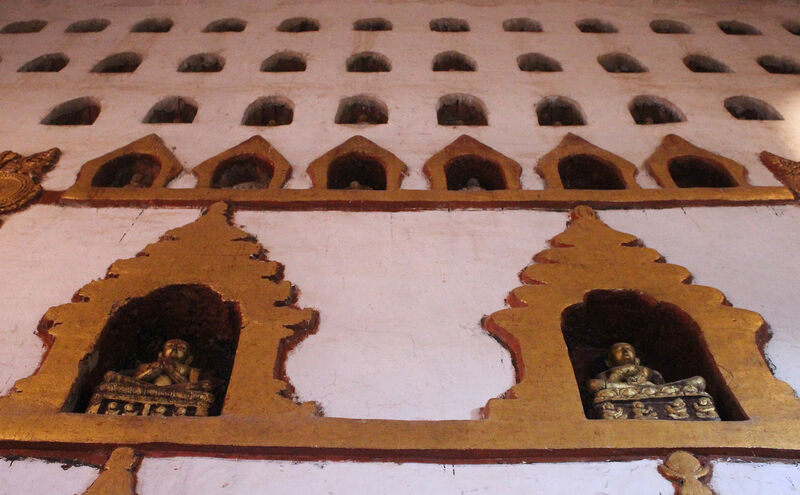 From any of these you can follow the inner or outer corridors which are lined with over a thousand niches. 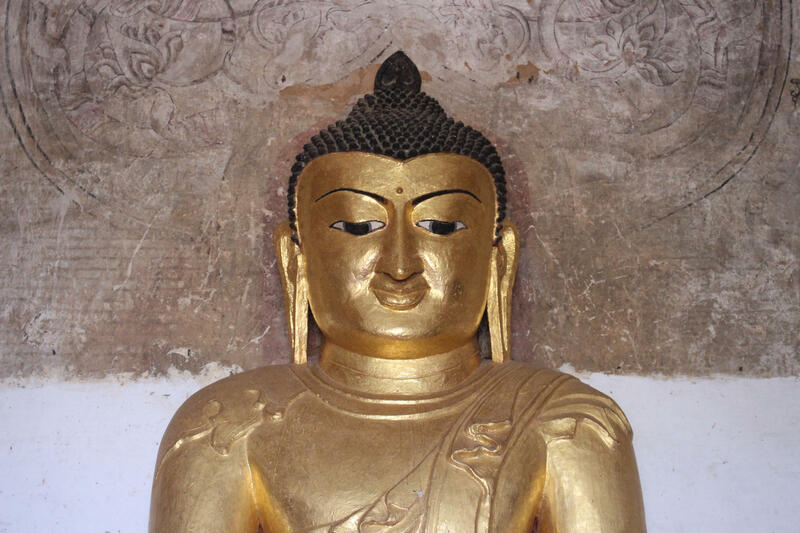 Most, but not all, of these contain images of Buddha. The effect is extraordinary. 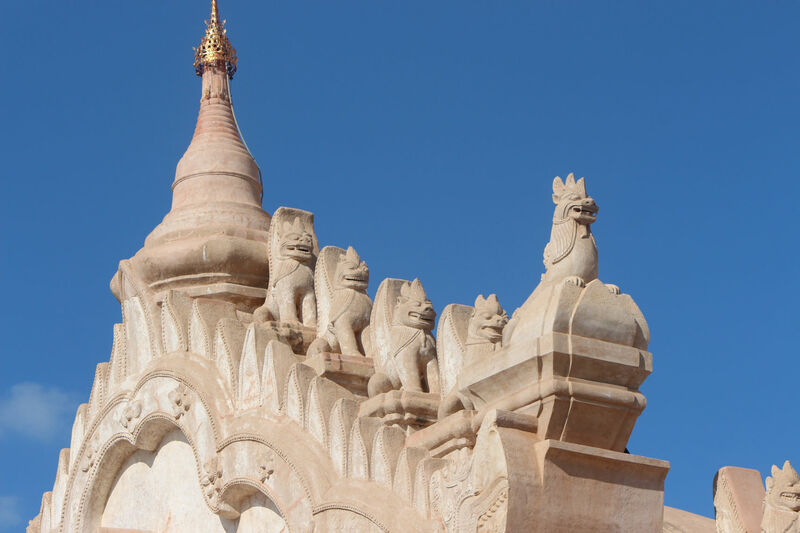 The Ananda Temple suffered considerable damage in the earthquake of 1975 which was then compounded by a ‘catastrophic’ restoration programme that saw its beautiful murals limewashed. In some ways it was a less damaging restoration than has been seen at other sites where liberal use of concrete and over enthusiastic re-construction to inauthentic designs appalled historians. 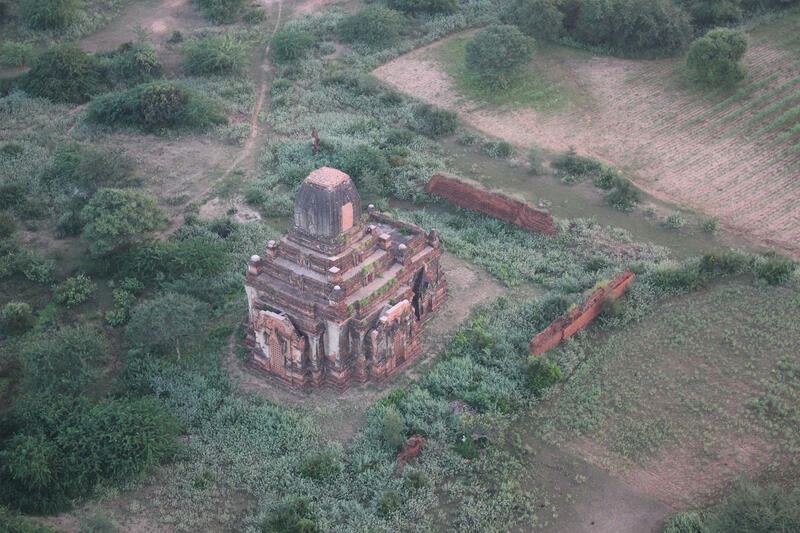 Thankfully, a six year programme of structural conservation and chemical preservation work by the Archaeological Survey of India (funded by the Indian Government at a cost of $3.2m) is reversing much of this damage. A quick glance at photographs taken before and after the chemical treatment started shows the difference this care and attention has already made to the external appearance, with all works expected to be complete by 2018. 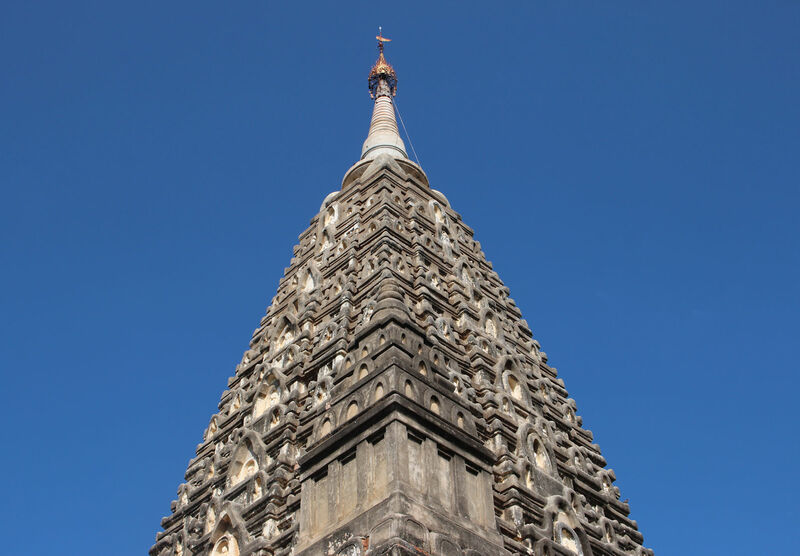 The unusual design of the Mahabodhi Temple catches your eye from the first moment that you glimpse its pyramidal tower from the upper terrace of the Shwegugyi Temple and it is no less impressive seen close-up. 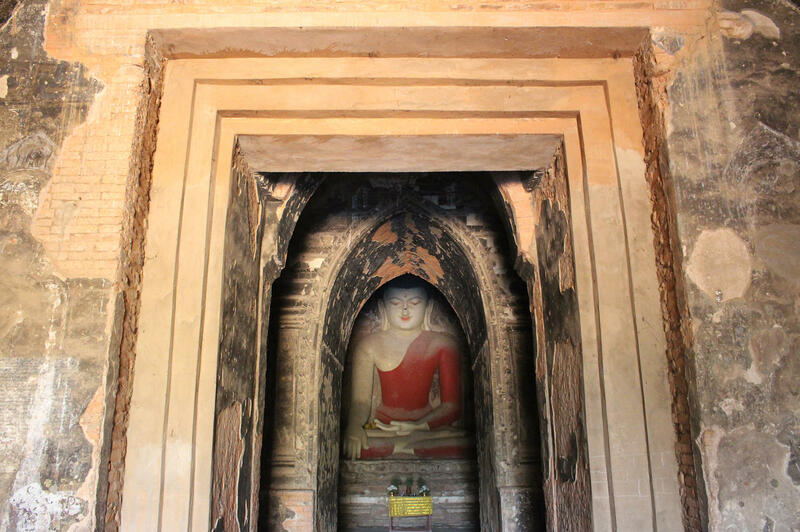 The sight of hundreds of niches filled with small statues of a seated Buddha is quite unlike anything else in Bagan. The very modest prayer hall can’t live up to the exterior but there are some interesting brick ruins to one side of the temple. 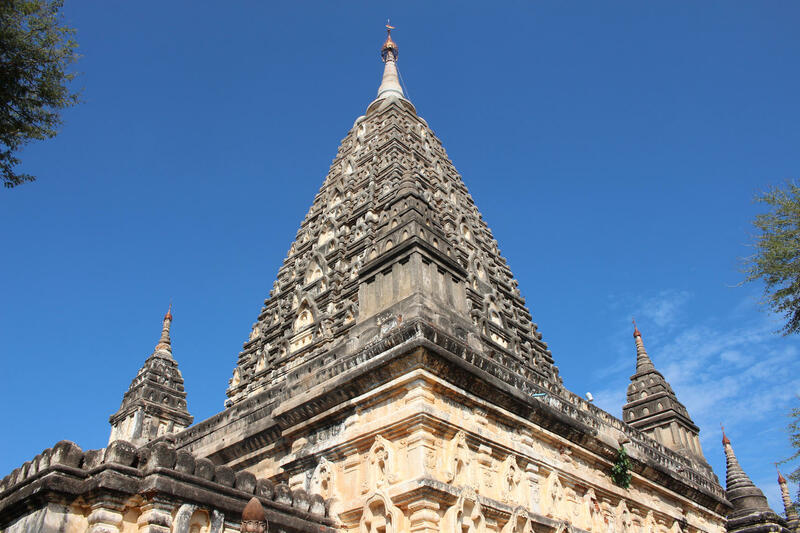 The temple here is a rather inexact copy of one of the most significant sites for pilgrims, the Mahabodhi Temple at Bodh Gaya in Bihar State, India, where Buddha is said to have reached enlightenment under the Bodhi Tree. 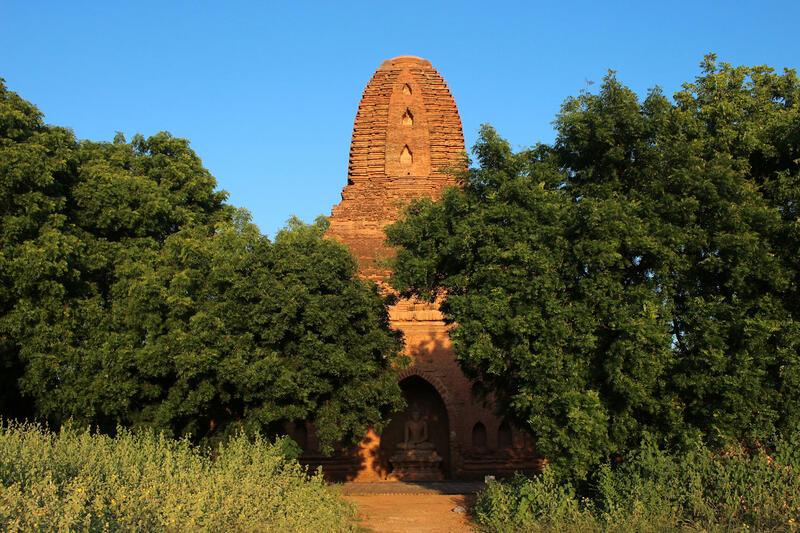 The original temple in India dates to the 6th century whilst the copy was constructed by King Nantaungmya (also known as Htilominlo) in the 13th century. 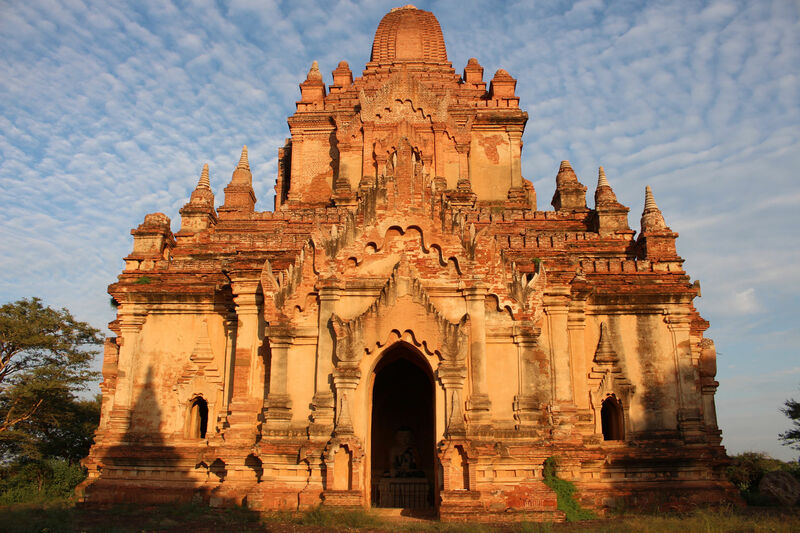 King Nantaungmya also built the Htilominlo Temple, one of the great temples of Bagan. 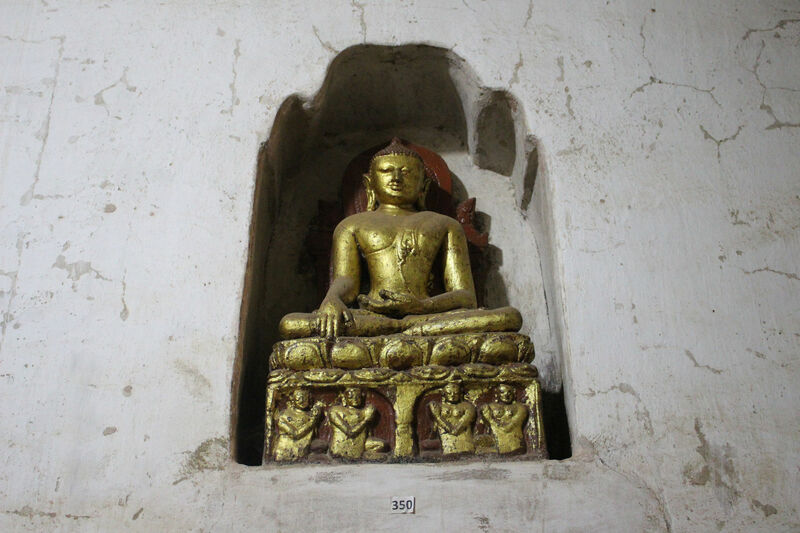 The Thandawgya image (dating to 1284) is a real surprise, tucked in a modest looking temple under a couple of trees between Shwegugyi and Thatbyinnyu. Indeed, it is sufficiently low key that I didn’t see anyone step inside in the entire time that we were in the neighbourhood which is a pity. 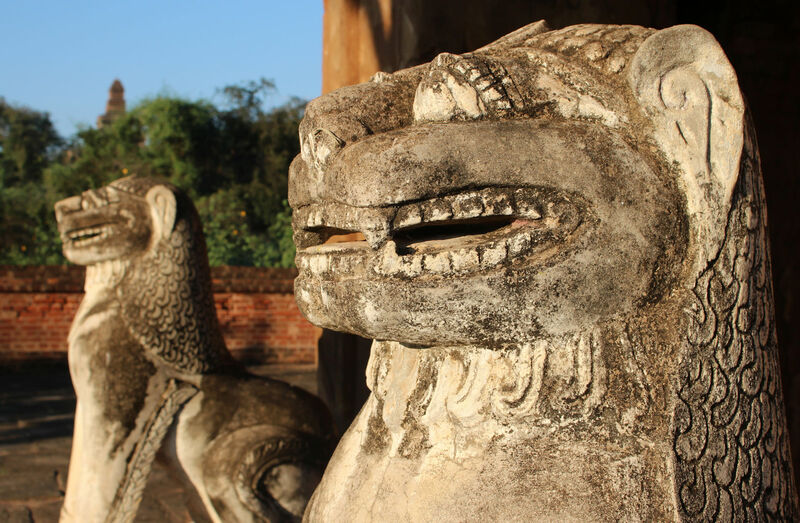 If I’m honest, I was drawn to the small brick walled compound by the two stone lions guarding the site rather than any thought of what might lay inside! 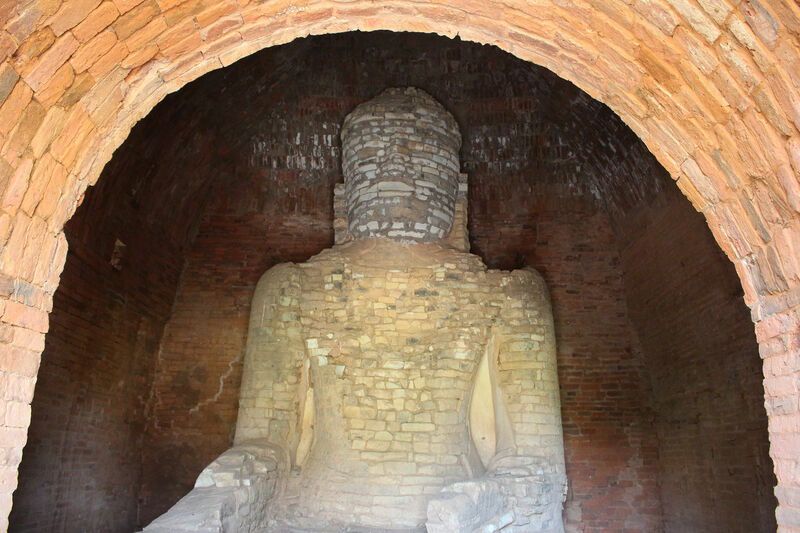 Stepping into the small brick temple you find yourself face to face with a six metre tall Buddha built with green sandstone blocks. 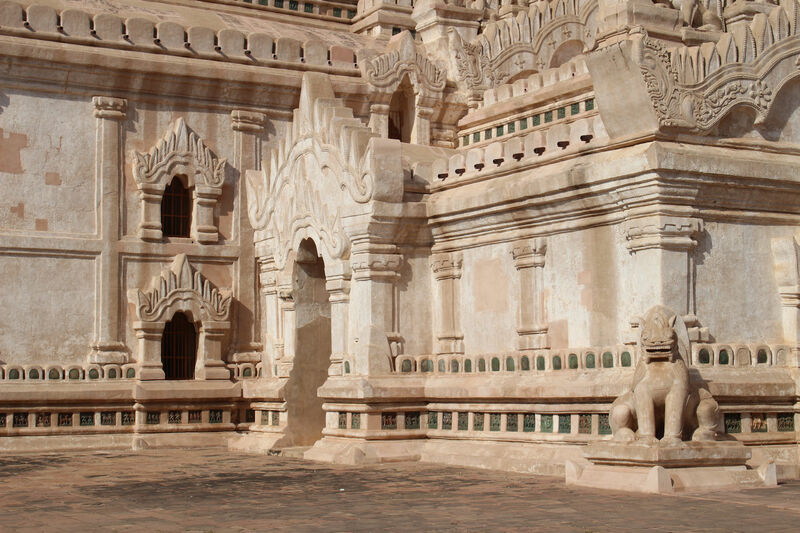 It’s striking appearance is not how it would originally have been seen – it’s just that the plaster has long since worn away (an undated picture in my copy of the Pictorial Guide to Bagan shows a black and white photograph of the statue in the ruins of the small temple, effectively in the open). 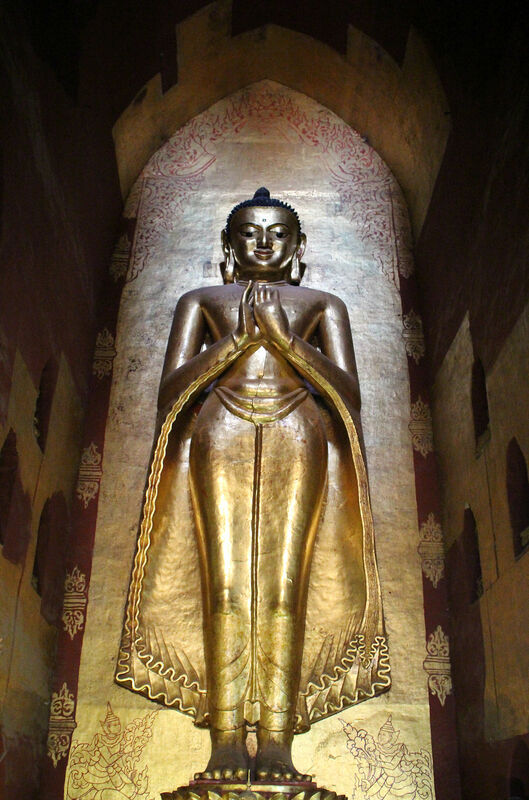 The Buddha was constructed by King Narathihapate, the last king of the Pagan empire, before he fled to Lower Burma in the wake of the Mongol invasion. 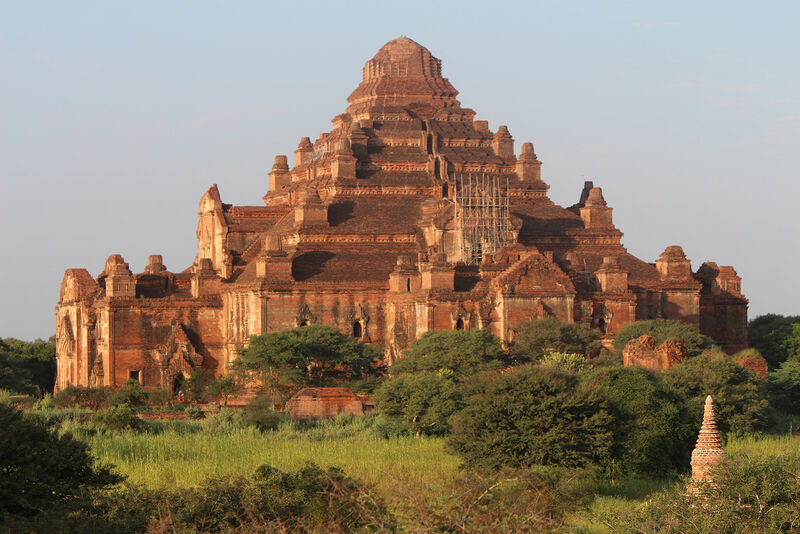 The Dhammayangyi Temple is a brute of a building, the largest on the plains of Bagan with six terraces. 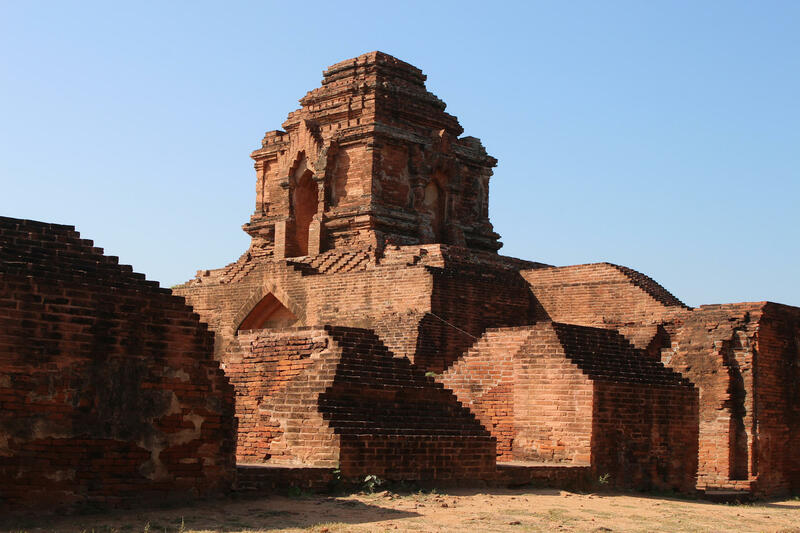 It follows the same plan as the Ananda Temple but here the inner ambulatory has been filled with rubble and bricked up, possibly to improve the stability of the structure. I don’t think anyone could claim that this place is pretty, even if the masonry is said to be superb, but there is something rather fascinating about the gloomy interior and it’s not hard to see why so many believe that it is haunted. 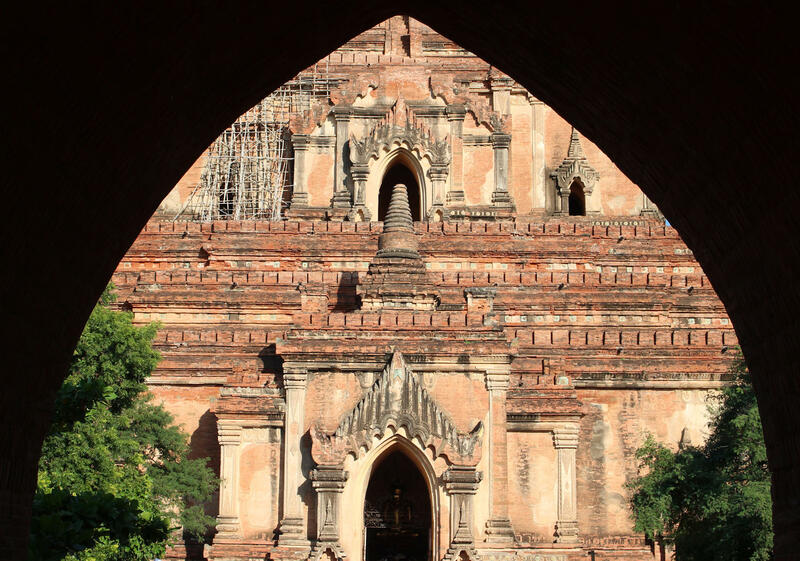 As we stepped inside the vast outer corridor we didn’t have long to wait before we could hear bats squeaking above us, occasionally swooping down for a flight along the length of the passage. The story of its construction sounds pretty chilling. King Narathu is said to have hoped that it would help atone for the murder of his bride, brother and father. However, Narathu had a rather strange way of going about this act of contrition – chopping off the hands of any masons who failed to meet his high standards (it was curtains for any mason who spaced the bricks far enough apart to allow a needle to pass between them). In the end Narathu was to meet his end two years after taking the throne, supposedly killed by assassins sent by his bride’s family. 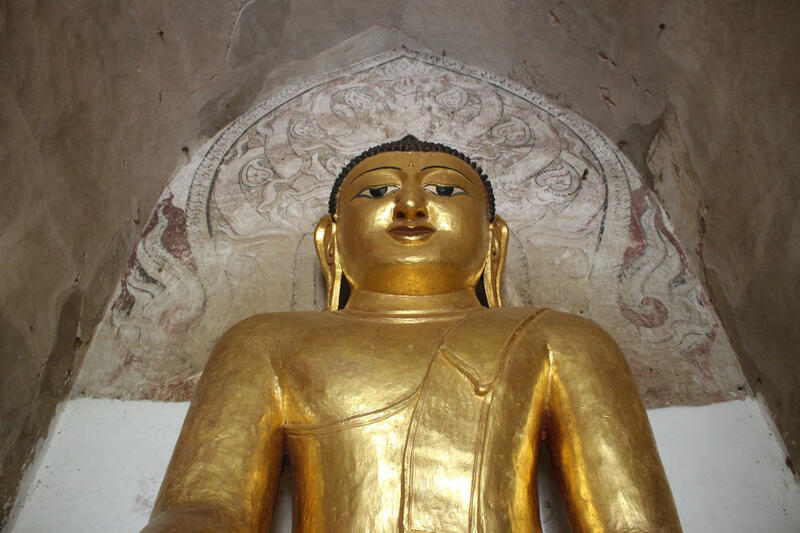 inpatient son (Narathu) would smother him to death to speed up his accession to the throne. 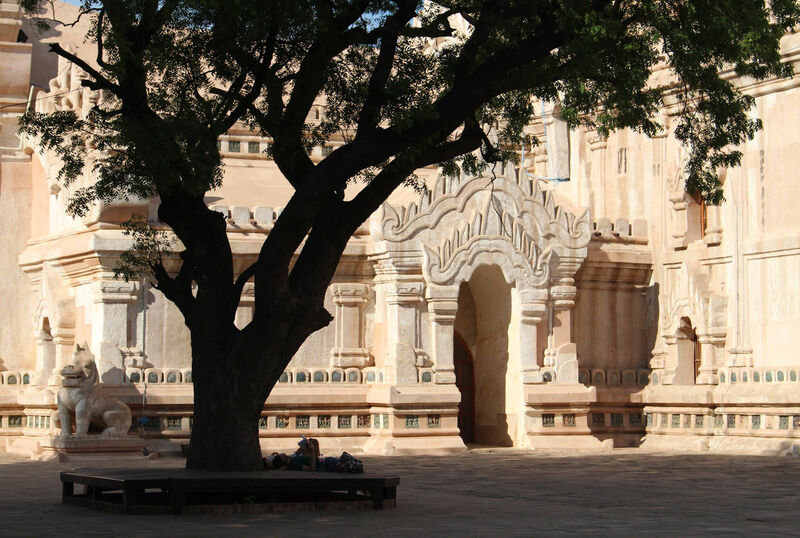 It’s a rather lovely temple with ornate wooden doors and a large Buddha. 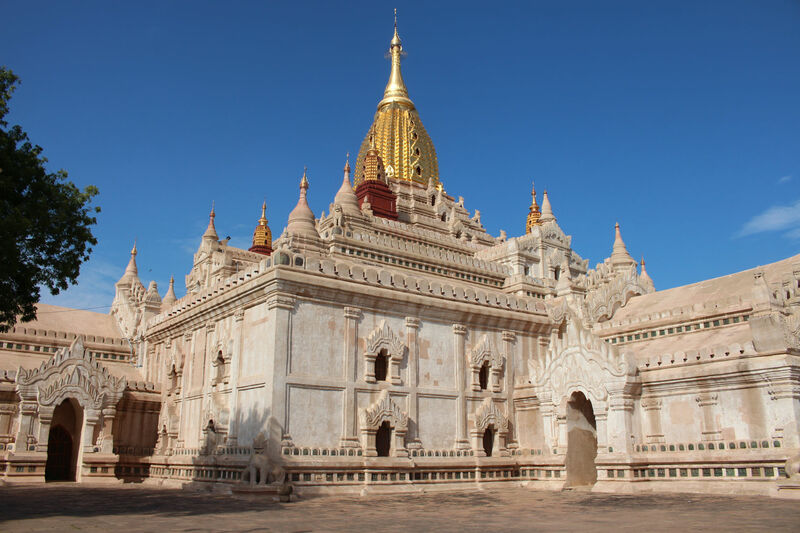 This is also one of the only temples in Old Bagan where the upper terrace is still open, reached via a small staircase, affording a terrific view of the ancient library and temples that surround it. 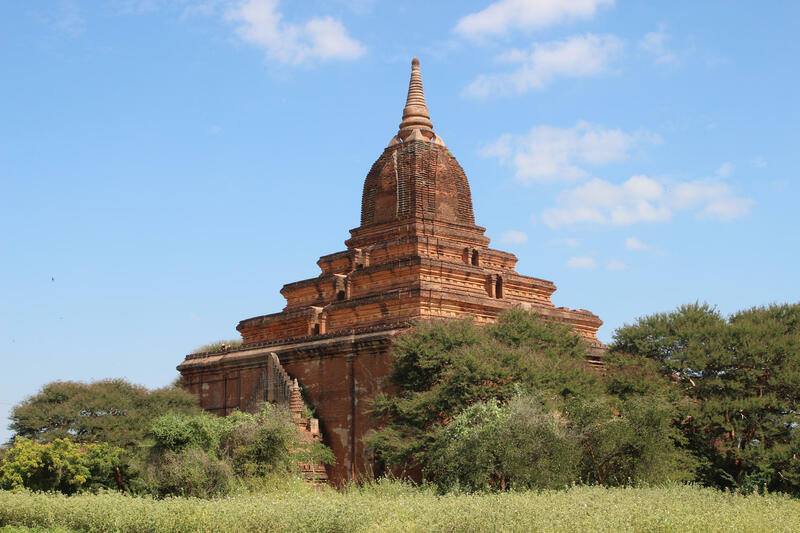 Thatbyinnyu Temple was built in 1144 by King Alangsithu and is the tallest temple (61m) in Bagan. 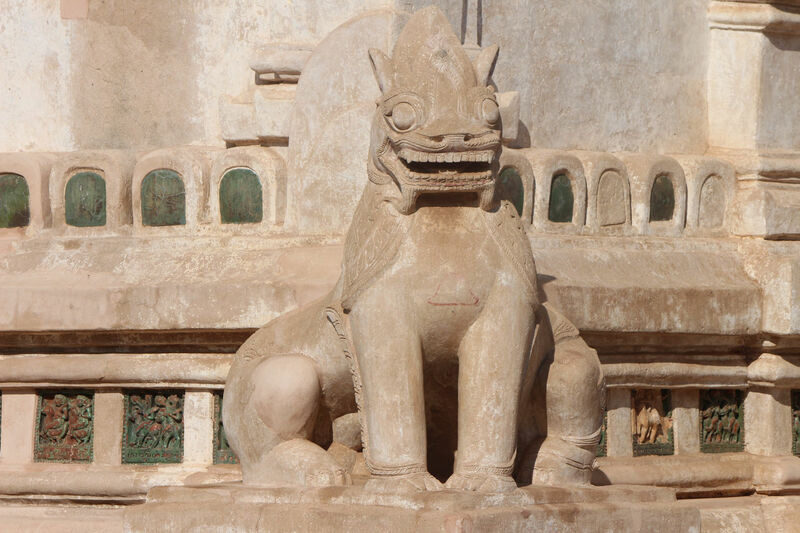 However, my reason for including this temple on my list of favourites is the very handsome guardian at the entrance! The temple was one of the worst affected by the earthquake in August 2016 and is in a group of 36 religious buildings prioritised for repair. 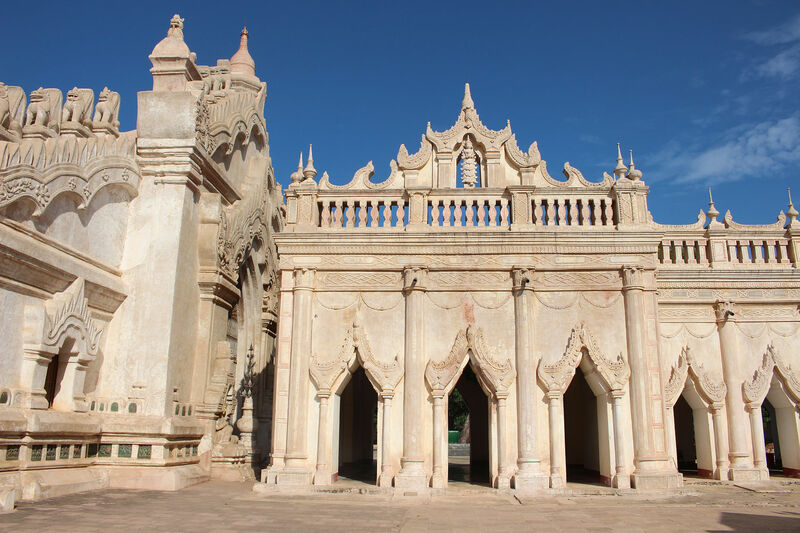 Restoration of the temple is expected to begin in 2018 following funding of US$1 million from the Chinese government. 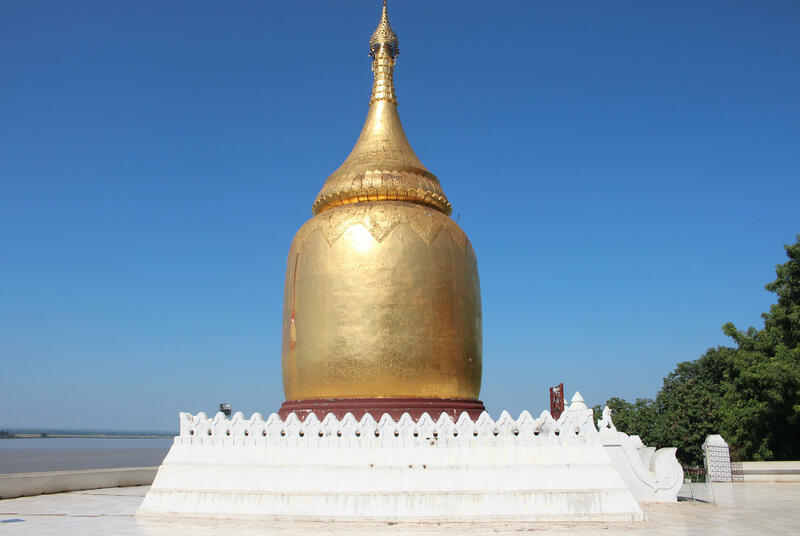 The Shwezigon Pagoda in Nyaung U feels much more like the temples I had seen in Yangon earlier in the year with a gilded stupa (encasing an earlier pagoda) surrounded by small shrines (from the convention to a revolving good luck cone). 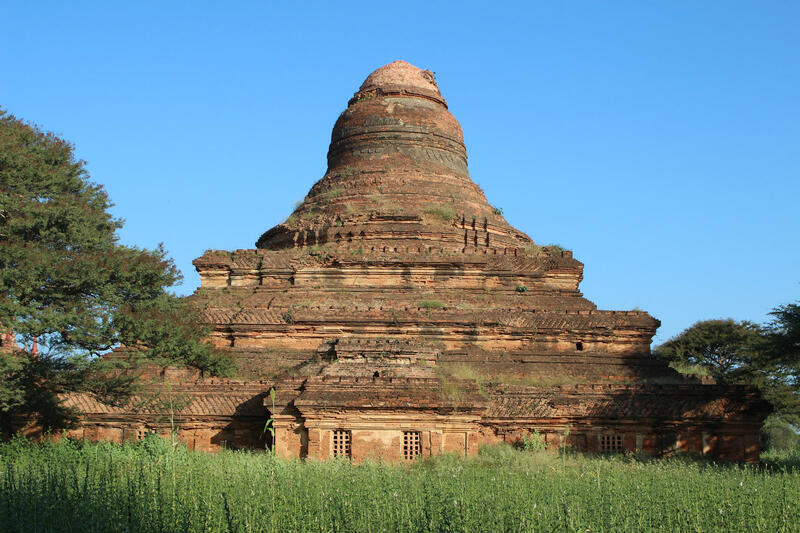 The earliest part of the temple was constructed by King Anawrahta, founder of the Pagan Empire, around the mid 11th century and the work was finished by his son, King Kyansittha, in 1102. 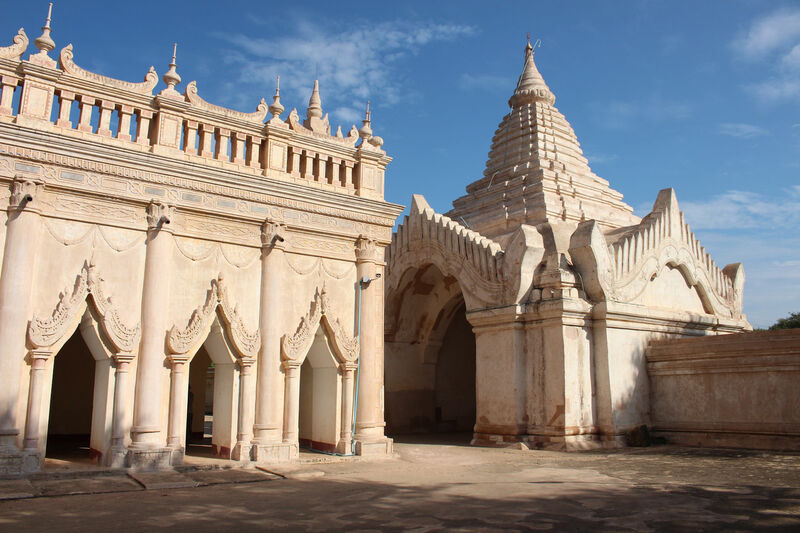 Other stops on our three day trip included Bulethi, Bupaya Pagoda, Gawdawpalin Temple, Gubyaukgyi Temple, Htilominlo, Kyanzittha Umin, Manuha Temple, Mingalazedi Pagoda, Nagayon Temple, Nathlaung Kyaung, Pahtothamya Temple, Pitakat Tait, Schwesandaw Pagoda and Sulamani Temple. Even then, I’m probably missing a few. 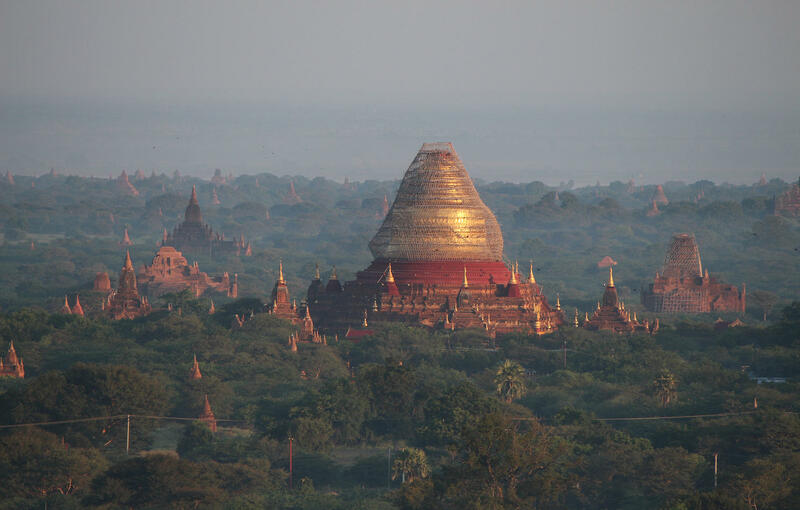 I don’t know what Bagan is like at the peak of high season but it never felt crowded at any spot we went, with the exception of my first attempt at a Bagan sunrise at Bulethi and the Shwezigon Pagoda. The visitor numbers may be rising but they still have quite a way to go before they match some of the world’s top tourist destinations. 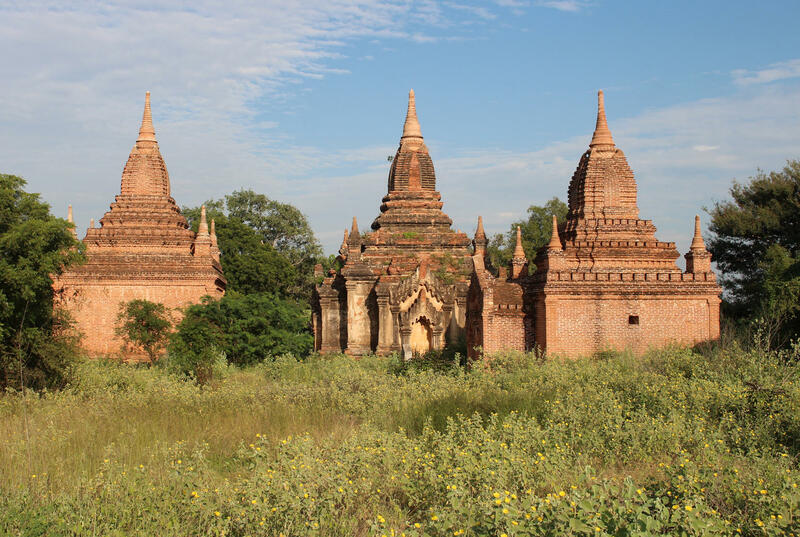 On the eastern bank of the Irrawaddy river, spread across a 40 square mile site in the plains of Bagan, the astonishing remains of over 2,500 temples can be found. 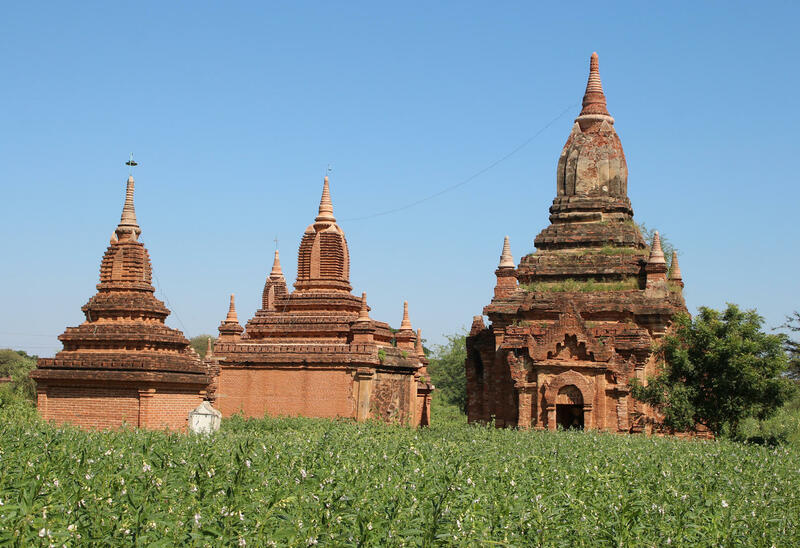 It is hard to comprehend that this dusty and largely rural spot was once the cosmopolitan capital of an empire or that at its peak, around the 11-13th centuries, you would have found around 14,000 stupas, temples and monasteries here. 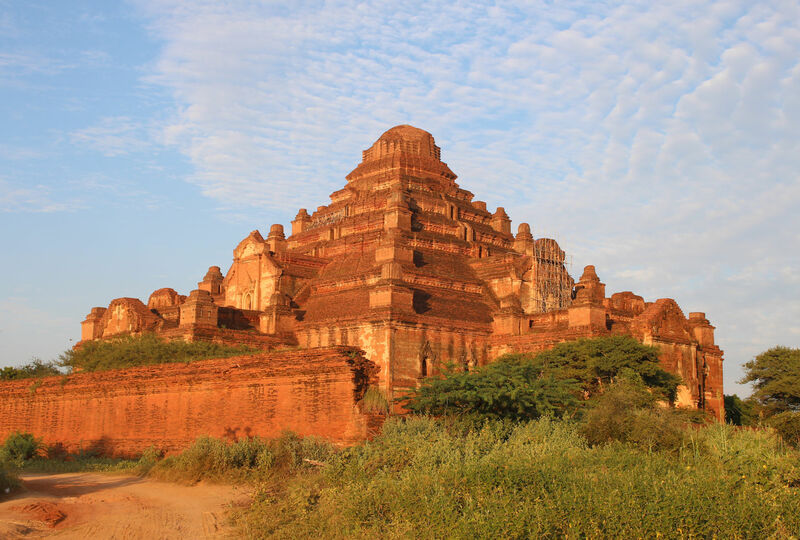 The reputation of Bagan as a city of learning attracted scholars from across Asia and its population grew to somewhere between 50,000 and 200,000. Marco Polo considered it to be ‘a very great and noble city’, marveling at gold and silver towers that shone most brilliantly when lit up by the sun. Not so long after Marco Polo’s visit the city was abandoned, around 1287, in the wake of the Mongol invasion of the Pagan empire. 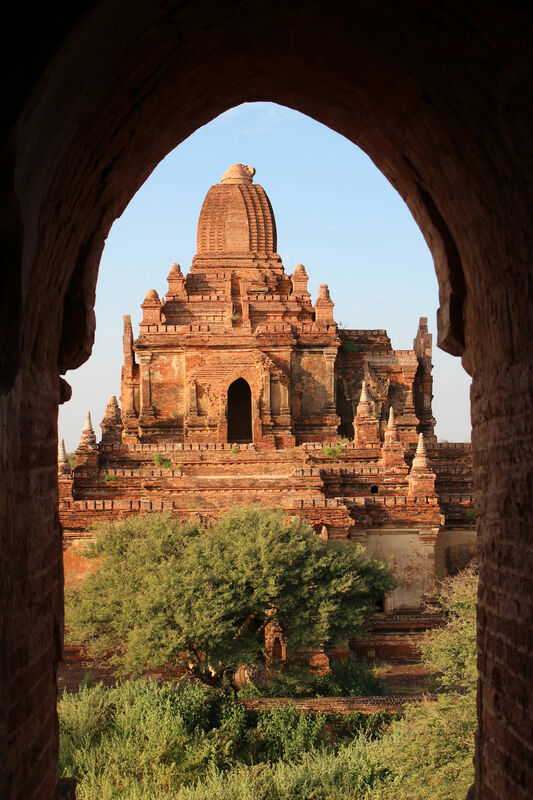 Over time the city was reduced to a modest village among the ruins, surviving until the demands of the tourist industry prompted the re-location of the population to New Bagan. 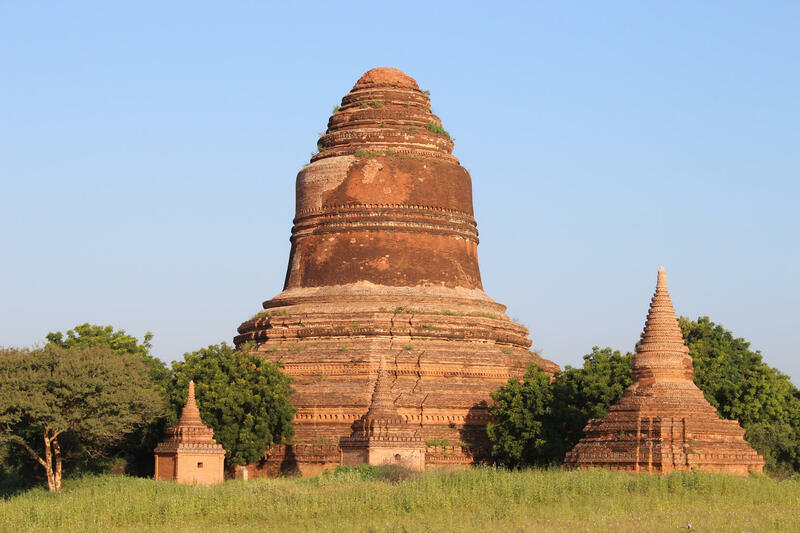 The infrastructure might not immediately suggest it but twenty first century Bagan is once again thriving with good hotels, restaurants and plenty of transport options to support a steady influx of tourists. 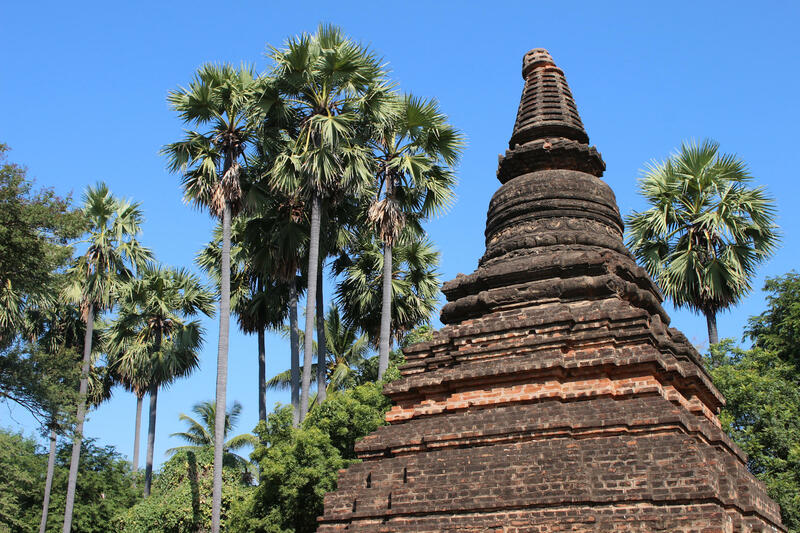 More change is undoubtedly coming, with new international flight connections mooted to link Bagan to Siem Reap and work on a long-stalled new hotel zone underway again. 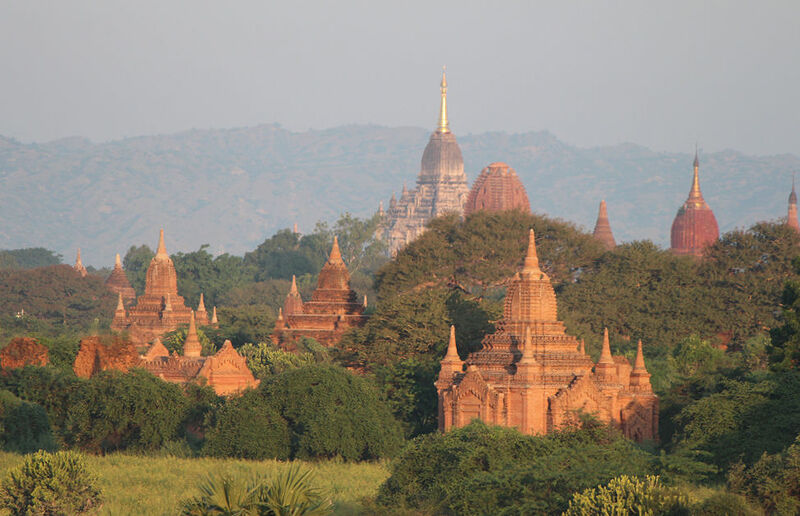 Bagan was the most tourist-friendly place I have seen in Myanmar by a long chalk. 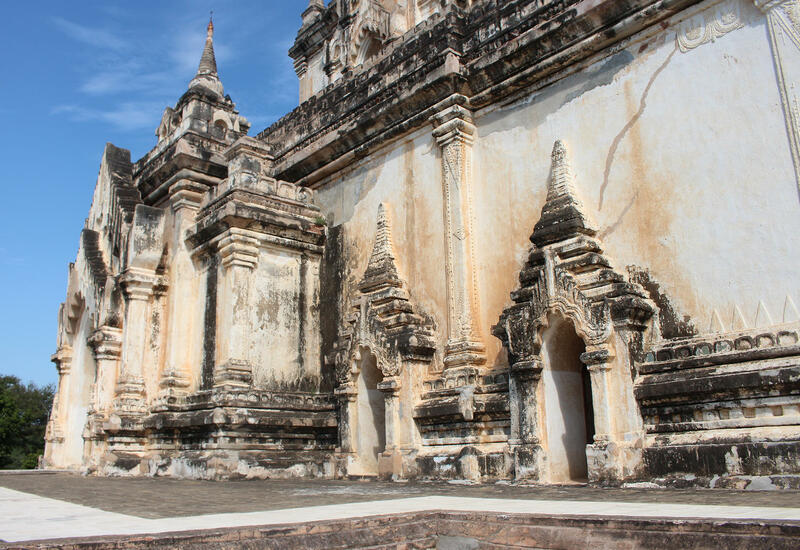 At the moment it is still relatively easy to get lost among the temples and find yourself alone but that will change if the visitors continue to grow at their incredible rates. 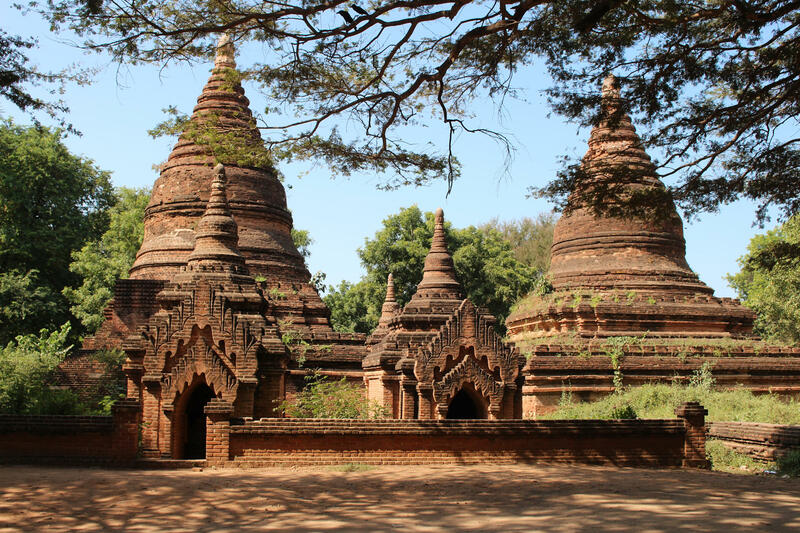 In 2010 Myanmar was visited by just under 800,000 tourists but by 2015 that had grown to nearly 5 million. 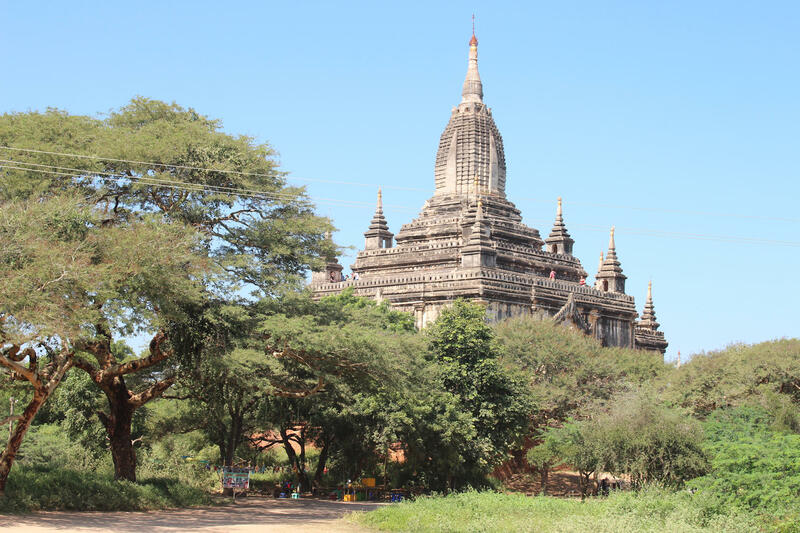 It’s not hard to see the appeal – my breath was taken away by my first sight of the forest of temples. I wondered why I had ever worried that the reality might prove a disappointment! 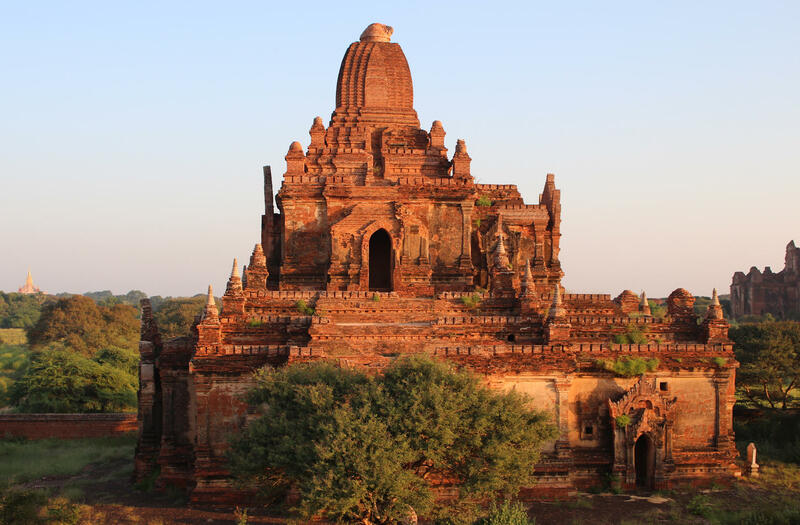 Our three day stay in Bagan began with a mid-evening flight into Nyaung-U, arriving around 9pm. It wasn’t meant to start that way, but the flight we booked with Mann Yadanarpon was re-timed by three hours just one week before our trip. I think it is pretty safe to say that it was the last flight of the day as they switched off the lights and locked the doors behind us as we stepped out to the taxi rank! 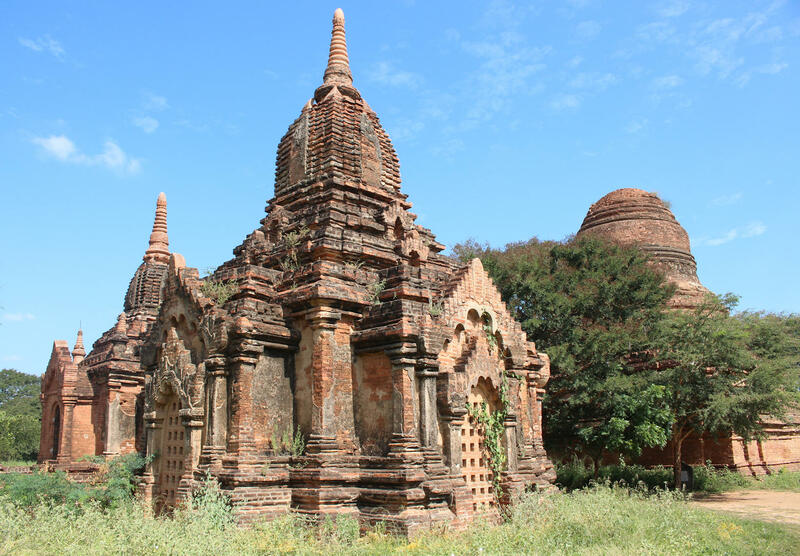 We spent one night in Nyaung U (at the Hotel Zfreeti) and then transferred to Old Bagan for three nights (at the Bagan Thande Hotel). 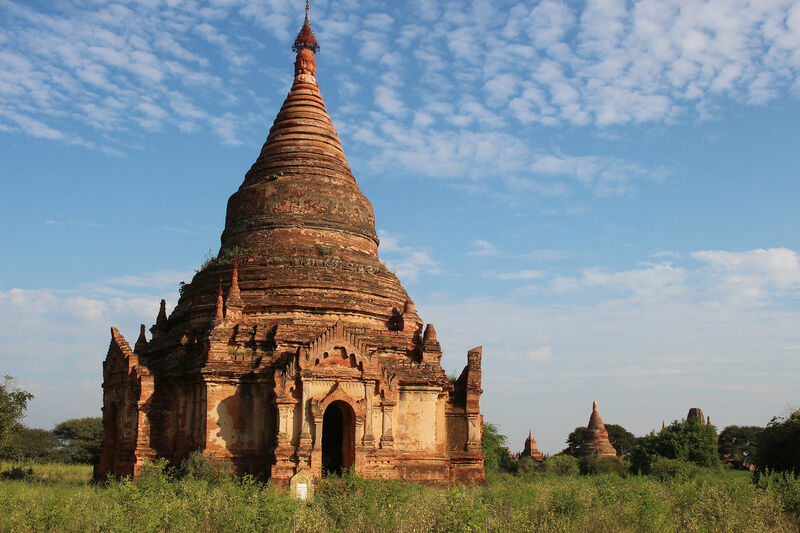 The location of the Bagan Thande proved hard to beat with the river on one side and the temples of Old Bagan just a few minutes walk away. 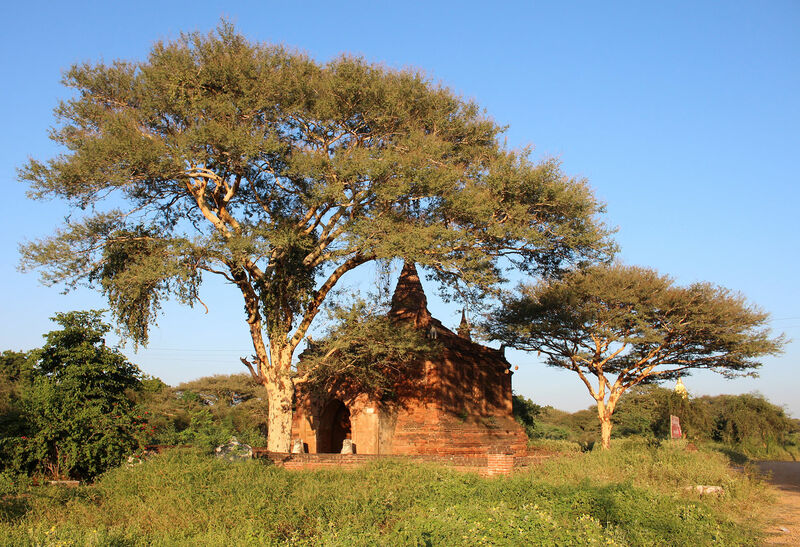 In the evenings it was a delight to sit for a meal under the acacia trees of the Bagan Thande as the light faded, occasionally catching sight of an owl or two (let’s not dwell on the bugs that occasionally dropped onto the table or into our food!). 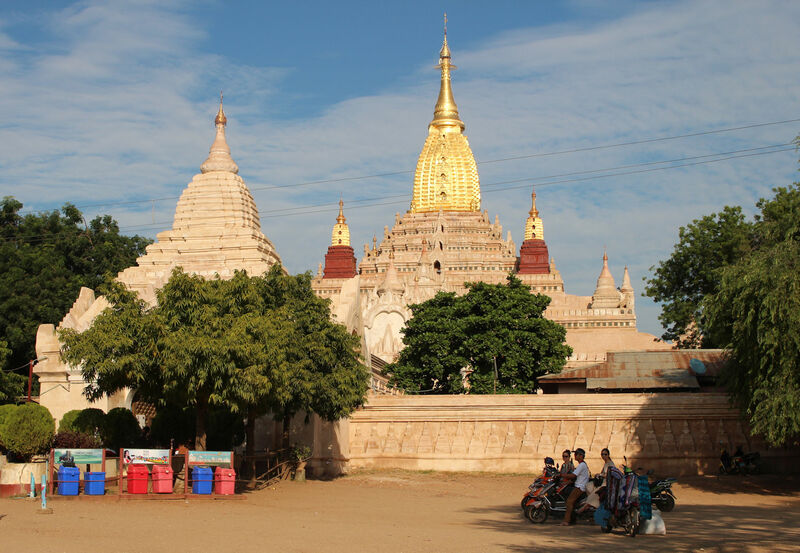 The location of our hotel made it easy to head out to the sights of Old Bagan on foot but for the sights further afield I eventually settled on cheap one way taxi rides. 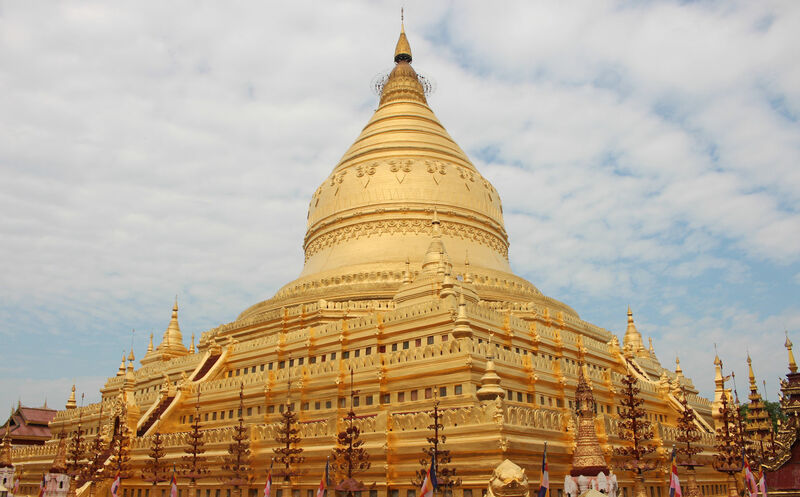 I would find a good starting point, such as Nagayon Temple, then slowly make my way back towards the hotel visiting pagodas along the way. I know that I could have opted for an e-bike but I preferred to take things at a slower pace and absolutely loved the freedom to wander unencumbered. Typically, I would sit out the hottest hours in our air conditioned hotel room or take a dip in the pool. The break also really helped avoid temple overload! I spent quite a while researching the options before we made our trip and really appreciated the wealth of information shared by other visitors. I thought I would share our experiences in case it helps anyone else ruminating over the same questions that bogged us down for a while! 1. Which domestic airline? I thought it would be simple to book a domestic flight but it turned out that tickets aren’t usually sold as far in advance as international flights and even when they were theoretically available many of the websites didn’t work. I had intended to book with an airline with a good safety record and the largest fleet size (admittedly none of the airlines seemed to have huge fleets) but in the end the choice came down to the first airline flying the right route that I could actually book! 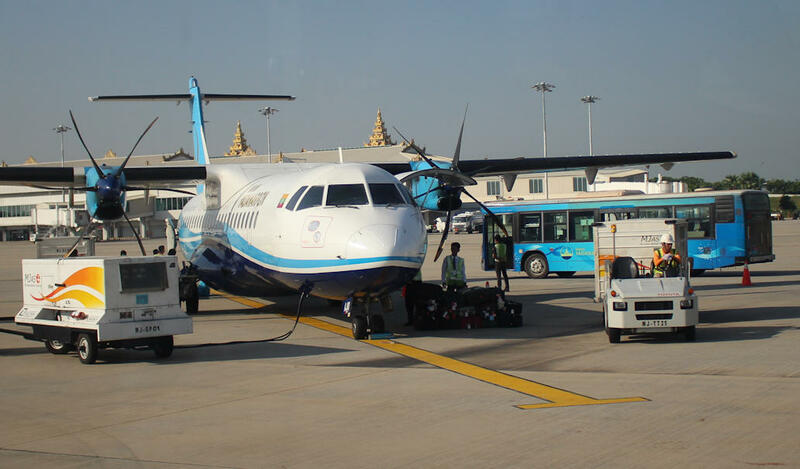 We flew to/from Bagan with Mann Yadanarpon, a small airline that began operations three years ago and which currently operates with a fleet of two ATR 72-600 aircraft. The whole operation seemed to be very efficient but far from the automated process we are most familiar with, starting with the wheeling away of our baggage from the check-in counters at Mandalay with handwritten tags attached! Everyone we encountered from the airline seemed friendly and helpful, which is not always a given. At check-in domestic passengers are given stickers showing their destination – a terrific visual cue that allows staff to easily spot passengers queuing for the wrong flight or not getting off at the right airport (some flights make a number of hops before reaching their final destination). Ultimately, I was happy with my choice or airline. The landings were a tad bumpy but we didn’t see anything that gave us particular cause for concern. 2. How reliable are flight times? 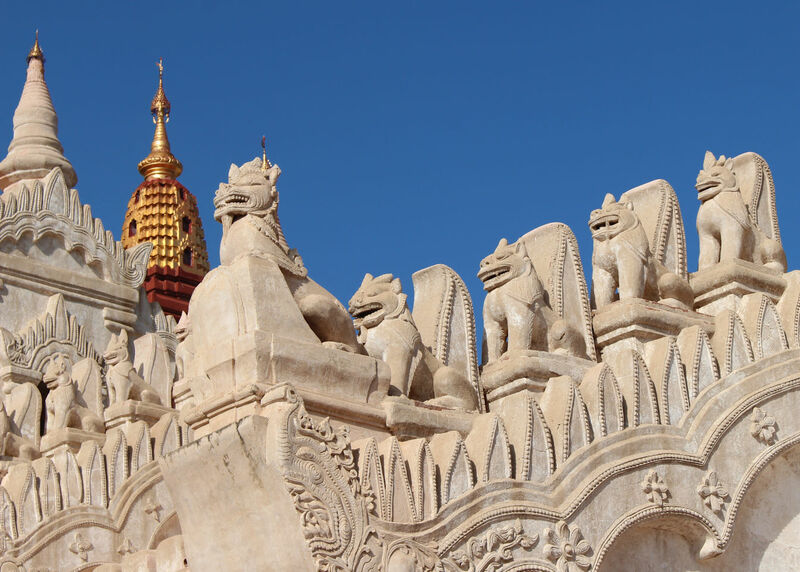 The flight time between Mandalay and Nyaung-U is just half an hour, if it is a direct flight, so you are barely up before you are on your way back down. Our direct flights were roughly 15-20 minutes late departing in each direction. I had booked my flights direct with the airline rather than through an agent. This worked out fine, but I would caution that our flights were re-timed in both directions and we only got notification of one set of changes. Our return flight was moved forward by half an hour without us knowing which could have been a tad problematic. Thankfully I’m super cautious. Although we were at the airport way too early for the expected departure time it turned out to be spot-on for our re-timed flight! 3. What cafes/shops are available at Nyaung U airport? The terminal building at Nyaung U is fairly basic but includes a cafe and a few gift shops. An enterprising stall holder at the entrance was selling postage stamps for a modest mark up. A counter here sells the obligatory Bagan Archaeological Zone passes (25,000 kyat per person for five days) and we were steered there as soon as we arrived. I was relieved to see that there was a small queue of taxis on the night we arrived. Some things you take for granted elsewhere, like departure boards, were not in evidence here. Everything at the airport seems to follow a manual process – even entry to the airside waiting hall for our return flight involved finding our names on a list and crossing them off. This thoroughness is quite re-assuring too – in each direction handwritten baggage tags stapled to our ticket were checked against those attached to the cases. 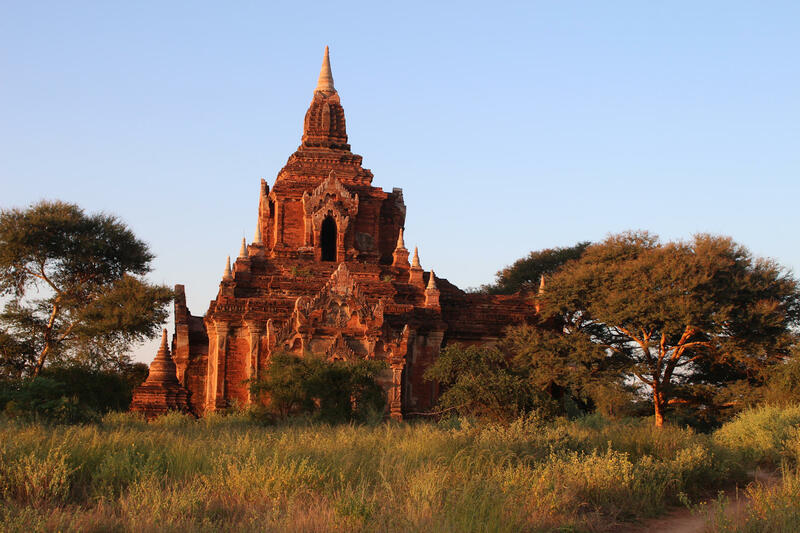 I have to say that most people I encountered in Bagan were riding around on eBikes, in larger coach parties or taking taxis. However, I liked the slower pace of a nice long walk and it definitely is possible. I wouldn’t have liked to be walking around for long in fading light though – the traffic coming off the plain is pretty relentless in the immediate aftermath of sunset. They even have traffic police directing the steady queue of bikes, cars and coaches off the dirt tracks back onto the main road. 5. Where’s best to stay? 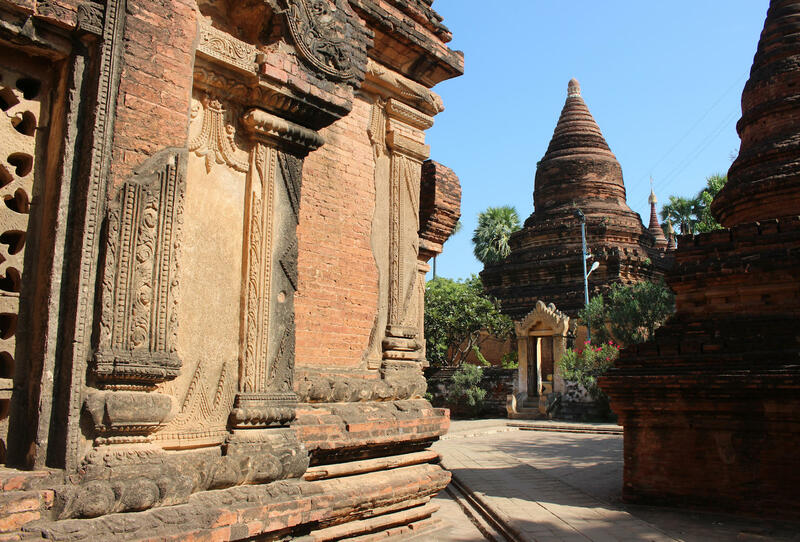 I was torn between the options of Nyaung U, Old Bagan and New Bagan. 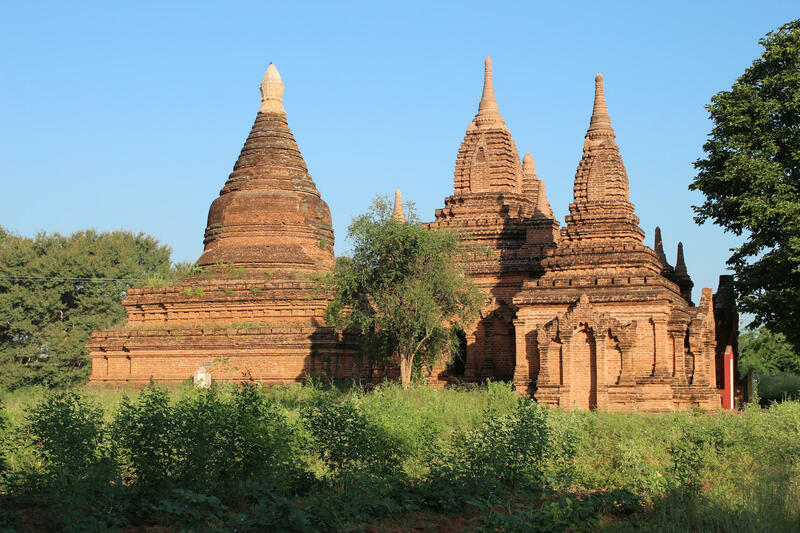 Each had its appeal but ultimately the ease of walking to/from Old Bagan and onto the plain swung the decision in favour of Old Bagan. 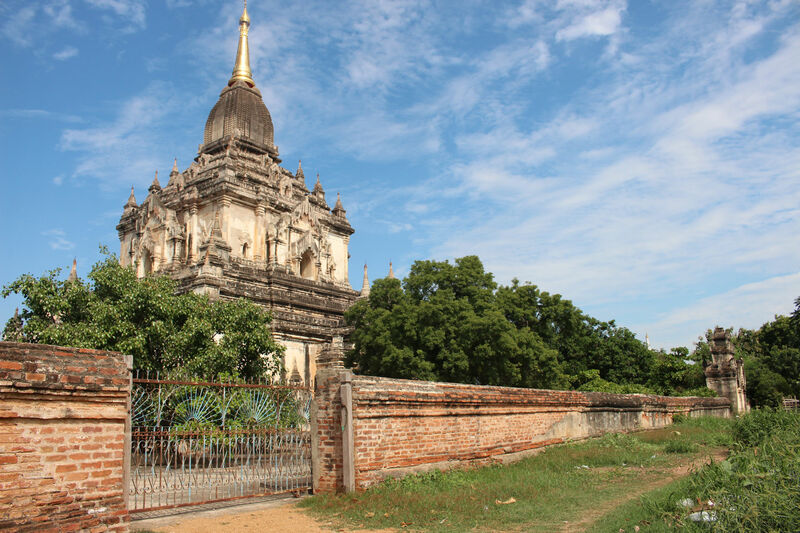 There are a few good restaurant options within easy reach of Old Bagan but many more at Nyaung U. None of the hotels are particularly cheap. 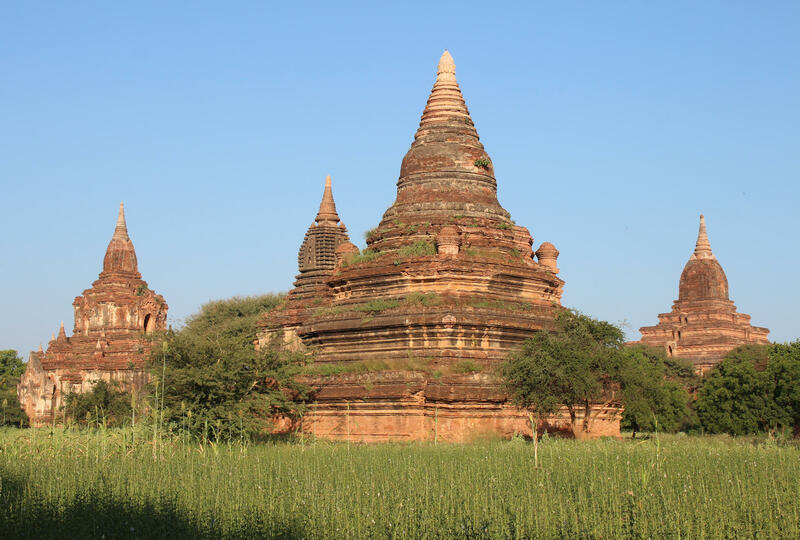 Our stay at the Zfreeti cost us $85 for one night whilst a room with a river view at the Bagan Thande set us back $200 a night. 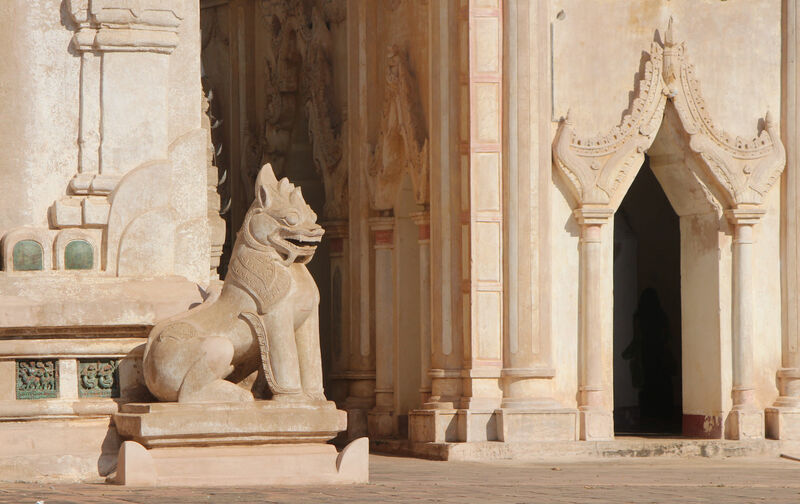 I would have to say that it was worth stumping up for a hotel amongst the sights of Old Bagan – it made all the sightseeing so much easier. Having said that, boats chug up and down the river at all hours and not at all quietly (a sort of super-charged tractor sound). It might not have been the quiet haven that we imagined but we did get used to it quite quickly. The river is also a good deal further away, and lower, than in the promotional shots. 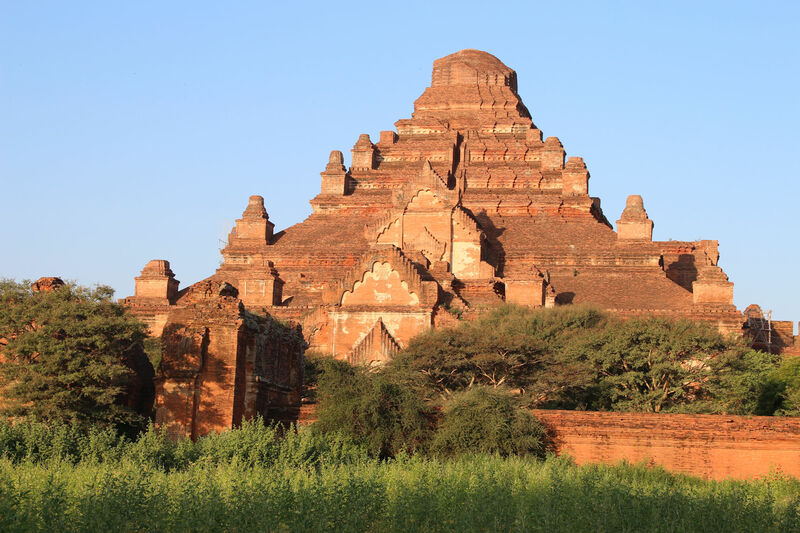 In the longer term the option of staying in Old Bagan is likely to disappear if the government commits to removing the Bagan Thande and some of the other hotel resorts from the Bagan Archaeological zone following the UNESCO recommendation. 6. Do you need anti-malarials? 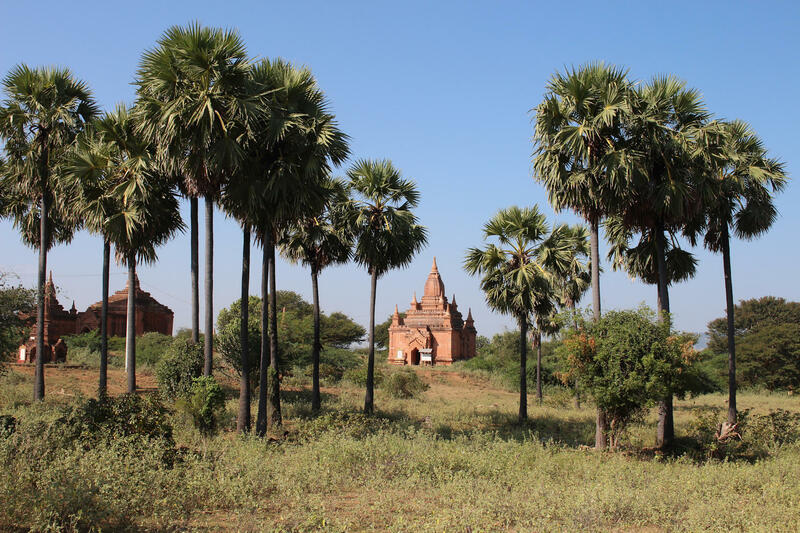 I found so much conflicting advice about whether anti-malarials were needed in Bagan. 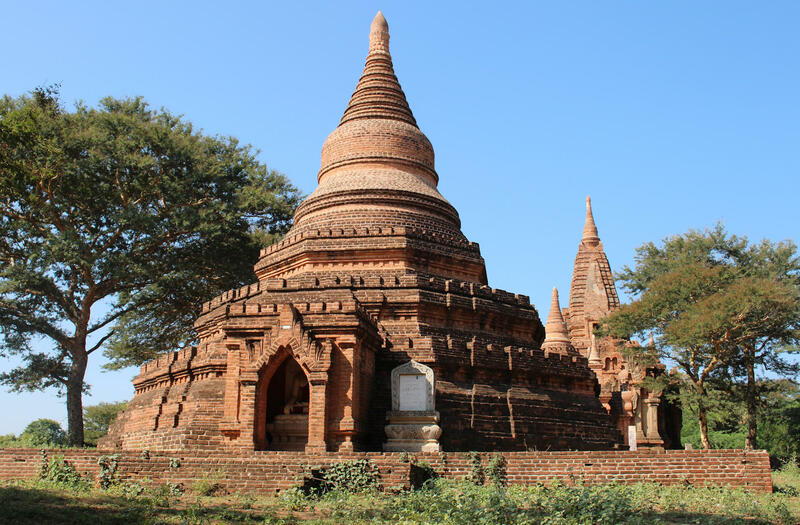 At the time we travelled the British National Health Service fit for travel website suggested that Bagan would be low risk for most travellers (with some exceptions relating to medical conditions etc) but highlighted the recent peak in dengue cases in Myanmar. Travelling in the dry season should have significantly reduced the level of risk, but to give ourselves the best chance of avoiding such perils we covered ourselves in insect repellent and wore clothing sprayed with permethrin. Ultimately, it’a decision that only you can make so don’t take my word for it. It’s much better to seek advice from the health professionals who know their stuff rather than rely on advice from travellers! 7. 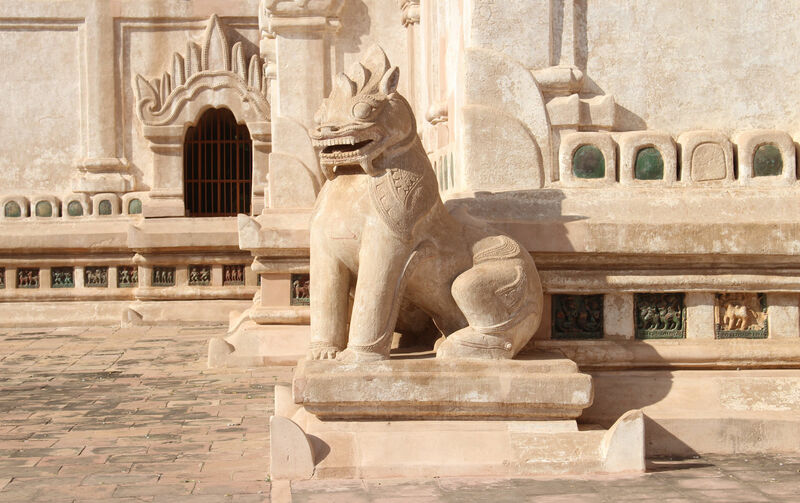 What essentials do you need for Bagan? 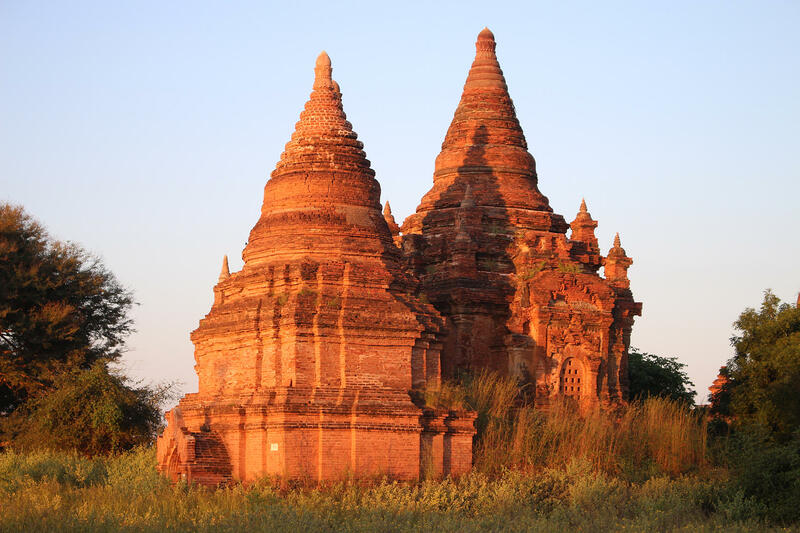 The absolute essential for a trip to Bagan is a powerful torch. The interiors of some of the pagodas are pretty gloomy and it would have been quite impossible to see any of the murals without a decent torch (with the exception of Gubyaukgyi temple, where it looked as though you might have been able to hire a rather unwieldy lamp for a wander round). 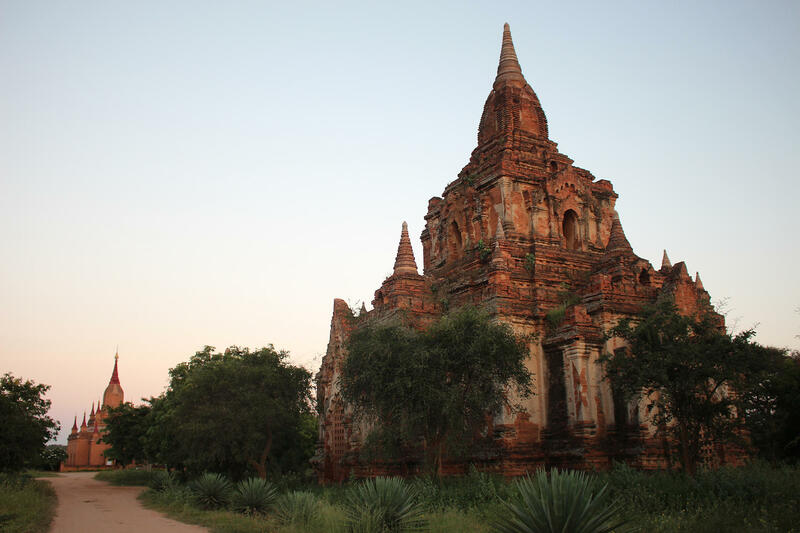 I also found it immensely helpful for navigating round the temples before sunrise. 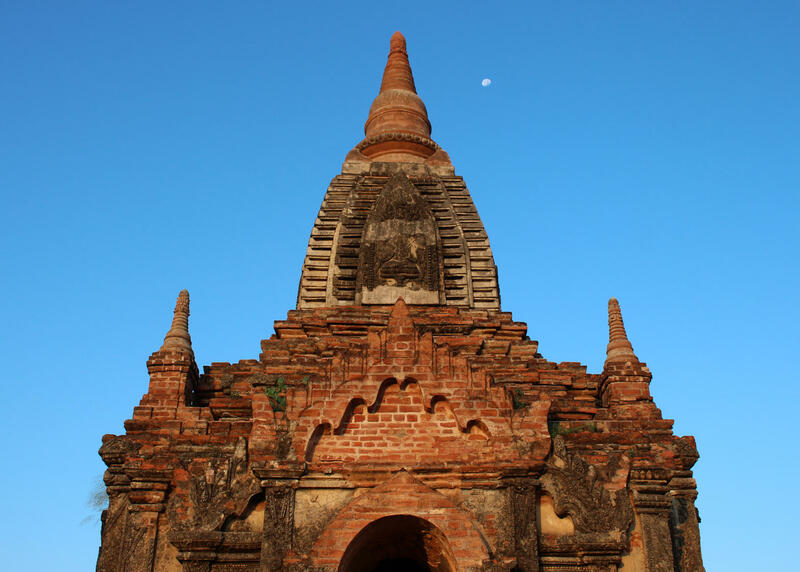 As there is no street lighting in Old Bagan a torch was also a necessity for even the shortest walk beyond the hotel grounds at night – as much to alert traffic to your presence as to see your way. I took a LED torch rated at 280 lumens with a reach of 220 metres and that was just perfect. 8. Can you still climb the temples? I had read that climbing the temples was to be banned this season so didn’t really know what to expect, but it turned out that there were at least a handful that were open to climb and there were also some perfectly decent viewing mounds that offered quite lovely views in their own right. 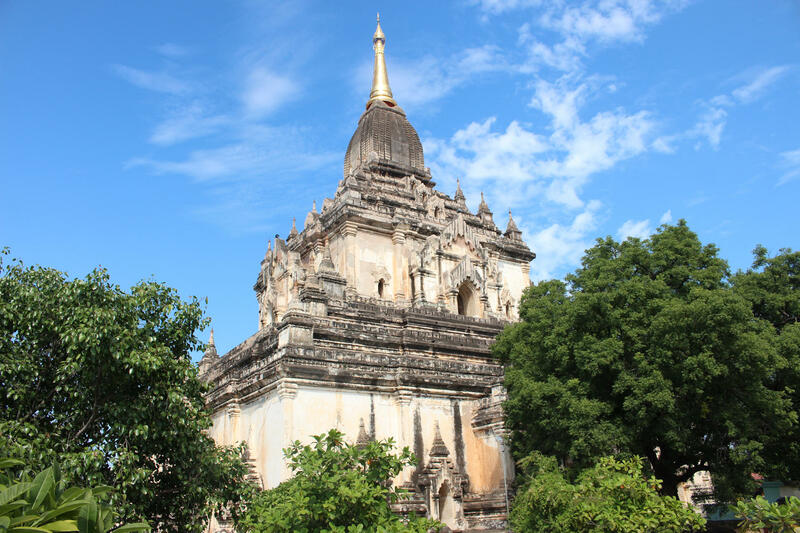 My favourite temple was Taung Guni, which proved a good spot for sunrise and sunset with a viewing platform that could be reached by interior staircase (good torch required). I also tried Bulethi and its near neighbour at sunrise, with narrow terraces accessed from steep steps on the exterior, but these were a little too crowded for my liking. 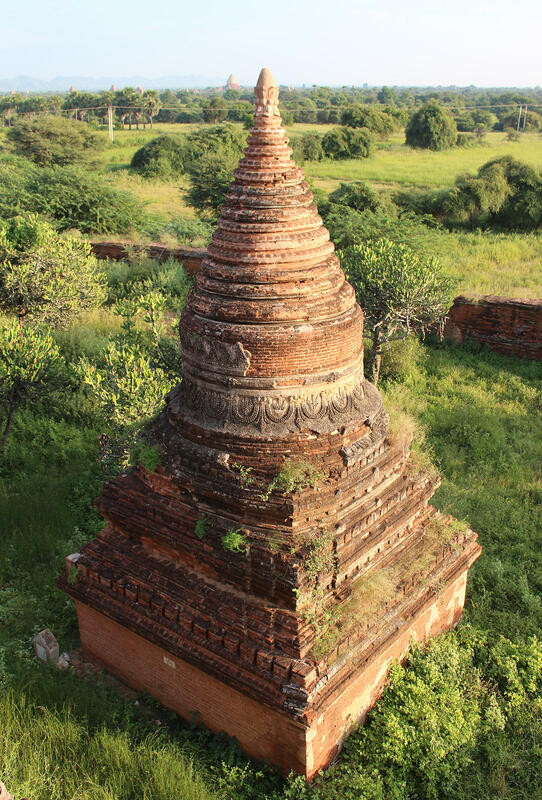 Officials checked the Bagan Archaeological Zone pass at both locations. 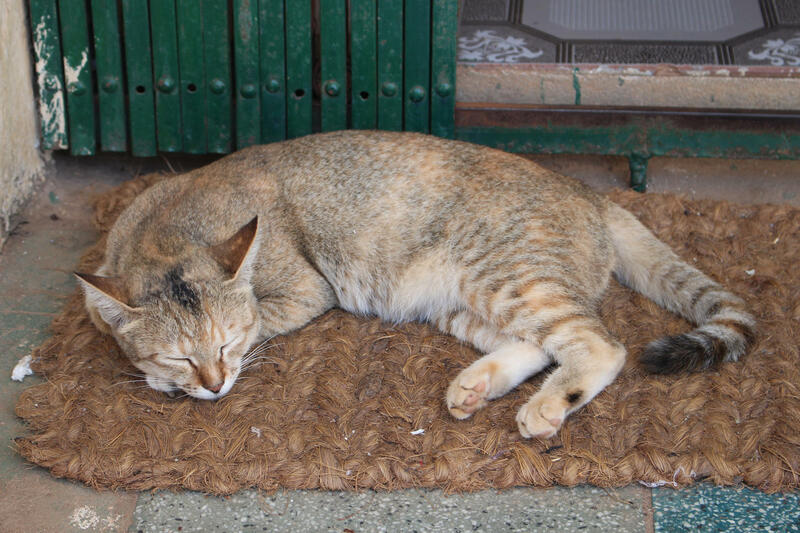 I kept an eye on the local press for developments, real time updates from Twitter and comments on Tripadvisor forums/reviews to see what was happening. It was still pretty confusing but it gave me a clearer idea of what was definitely closed and some ideas of what could be open. 9. 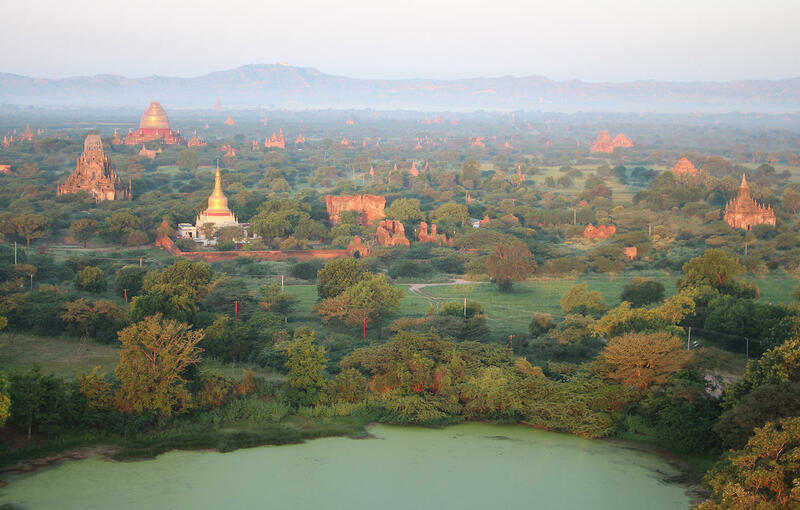 Is it still worth taking a balloon flight over Bagan? I wasn’t sure whether the expense of a balloon flight would be worthwhile as many accounts suggested that the experience doesn’t compare to what used to be on offer. I don’t know about that, but I can say that a flight over the temples in a balloon was the undisputed highlight of the trip. 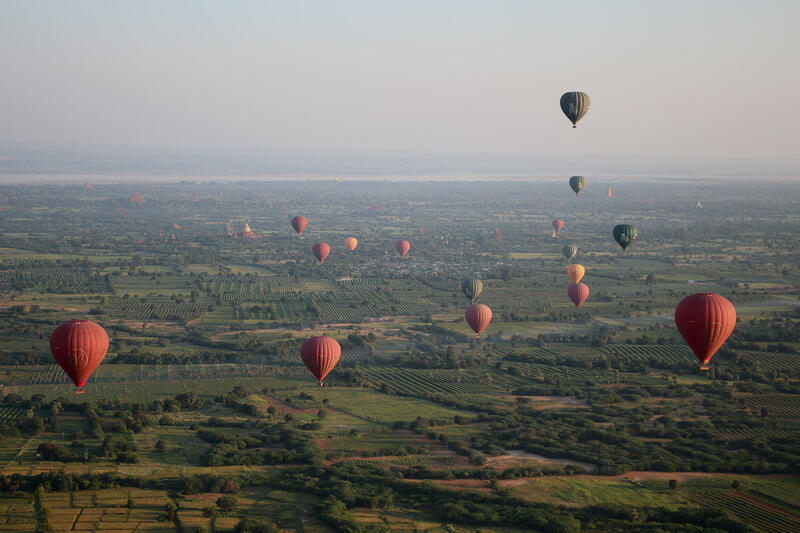 I was also really impressed by the safety standards in place at Balloons over Bagan and thought that it was as safe a balloon ride as you could hope for, accepting that there is always a degree of risk. I suffer terribly from a fear of heights but this didn’t kick in at all. It was a lovely experience from start to finish and the views are extraordinary – I’m guessing that they have been more spectacular still in the past, but I was perfectly happy with what I got to see.